Drum-roll please! 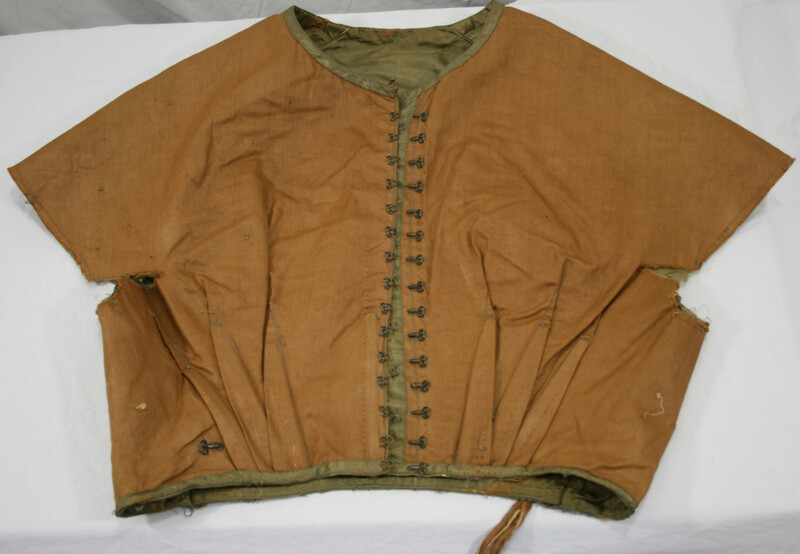 Today I present for you the oldest garment currently in my collection. 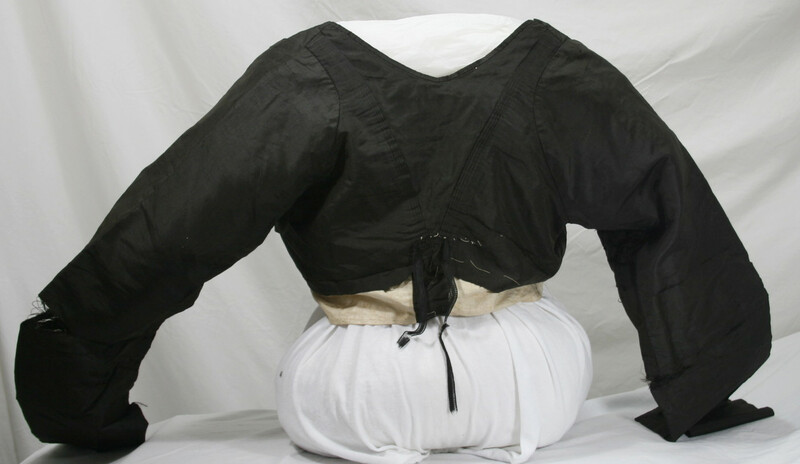 This bodice dates to early in the “regency” fashion era, and has many earmarks of that unique transitional era in women’s clothing… when we get a mash up of construction techniques that were used in the 18th century, and the techniques that will become common in the 19th century. 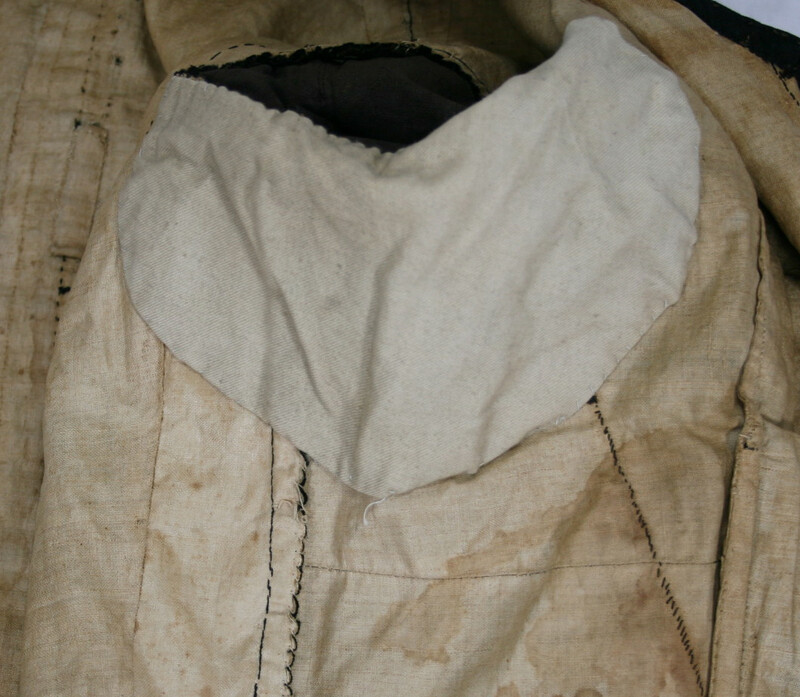 The lining is in two pieces which overlap and pin shut. 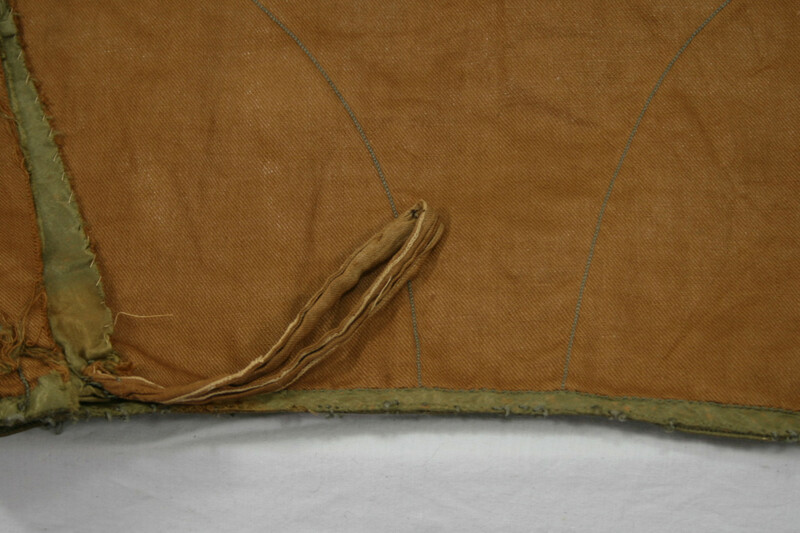 The front of the silk has a drawstring casing at the neck edge. 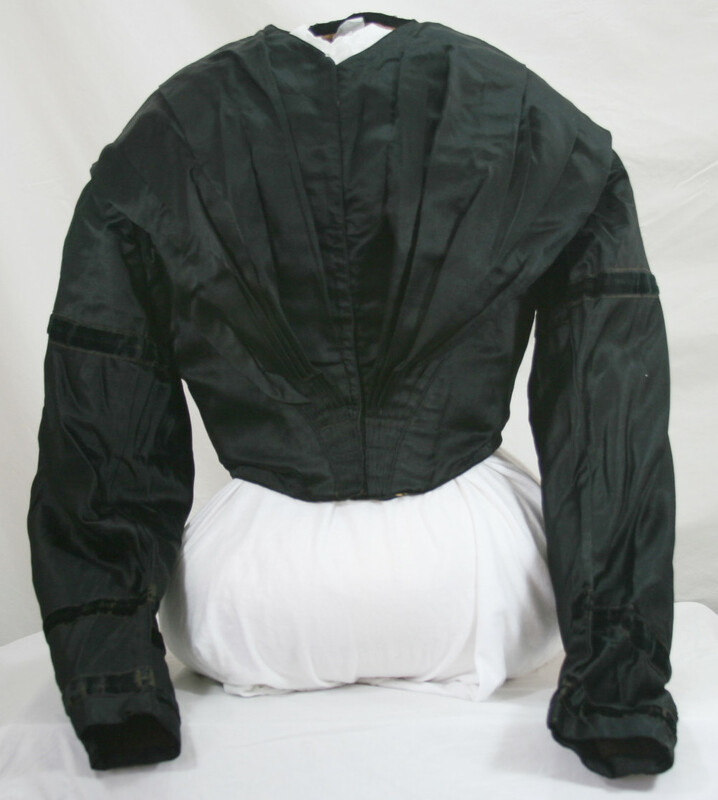 The drawstring would have been pulled up and the bodice would have been gathered in the front. 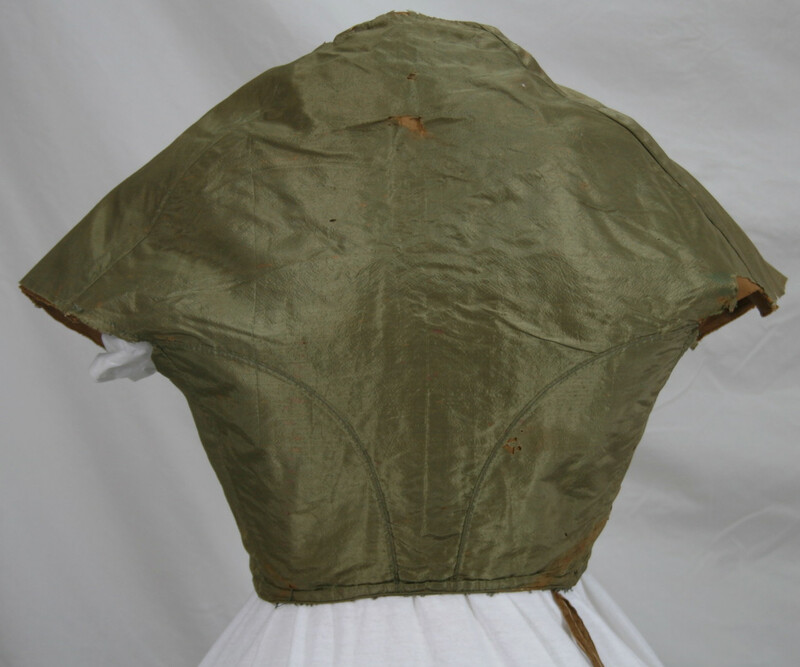 Here is a closer view of the tucks on the back, which adds a nice decorative element to this bodice. 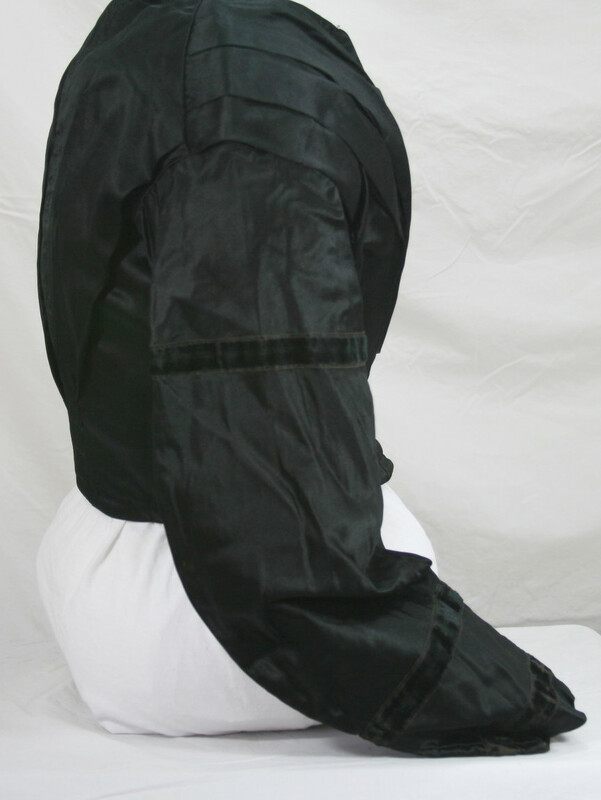 Also, note how the sleeves are set- the armyce comes into the area of the shoulder blades. There are less than 8″ in between the sleeves. 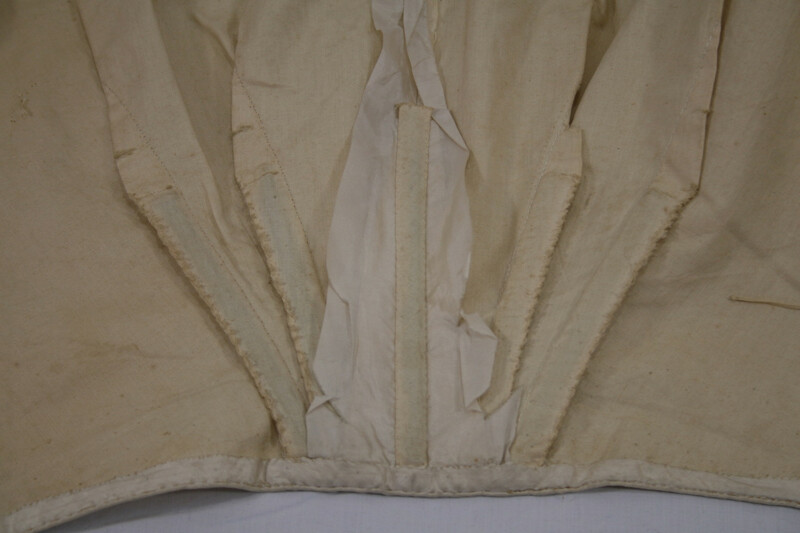 The underarm area of the bodice is very carefully mended on both sides where the fabric had worn thin. Each sleeve has a long and narrow gusset in the underarm seam. The sleeve cuff is gently rounded, and judging by the length of the sleeves, likely hit about the knuckle of the wearer. There is the remains of a tie at the center back. 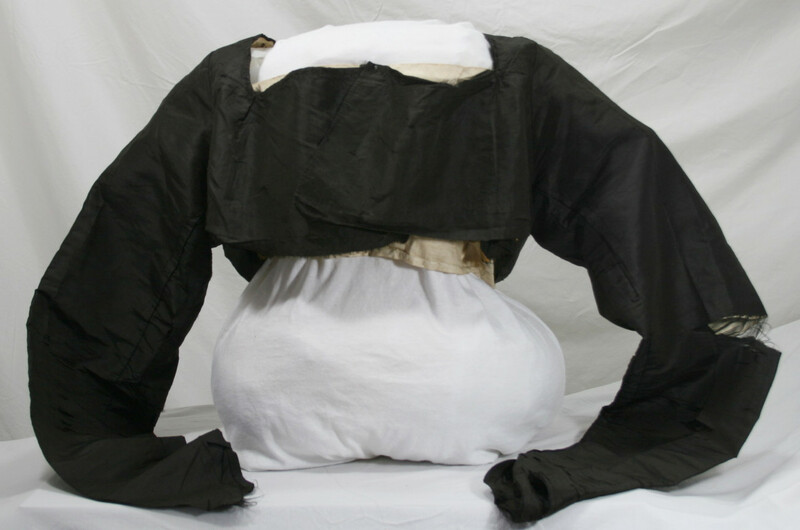 This would help ensure a snug fit of the bodice on the wearer. 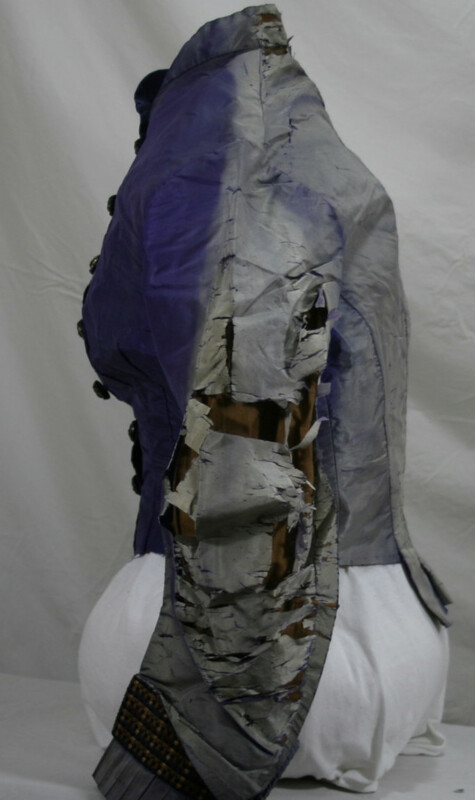 Here, you can see how much longer the lining is than the fashion fabric. 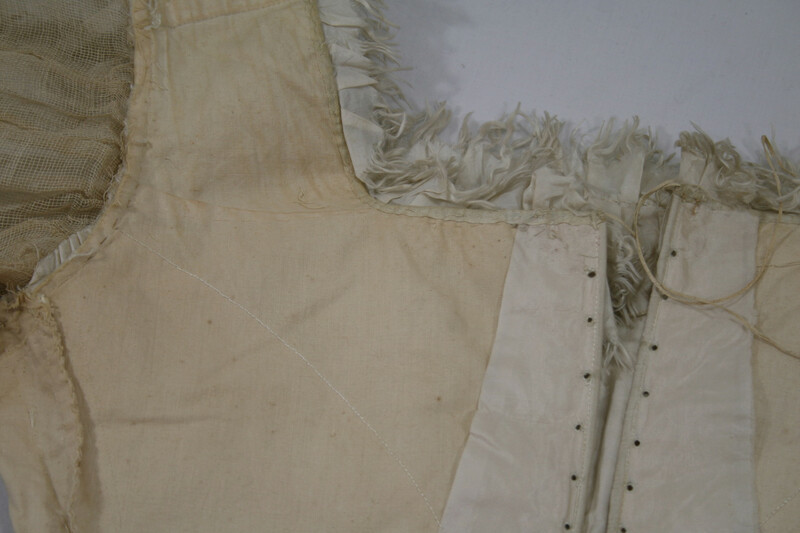 This is the inside of one side of the front of the bodice. 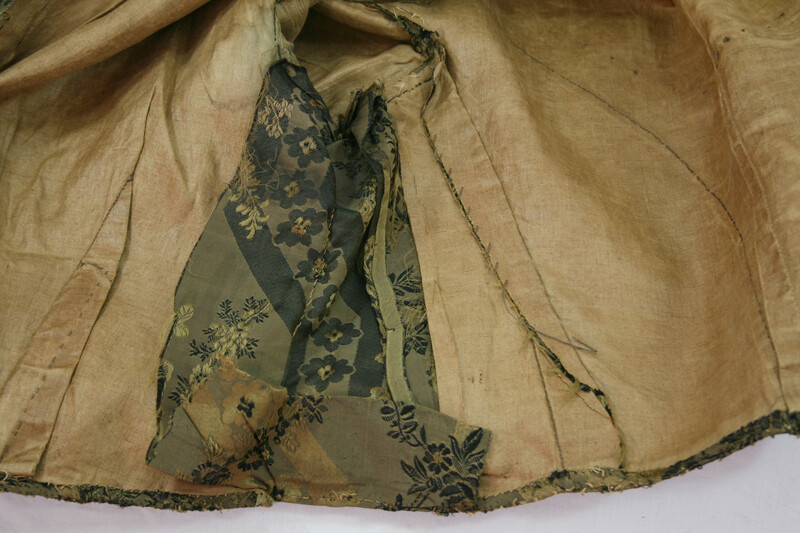 The fabric in many places has just been folded to fit- you can see how much fabric was left hanging below the casing for the drawstring. 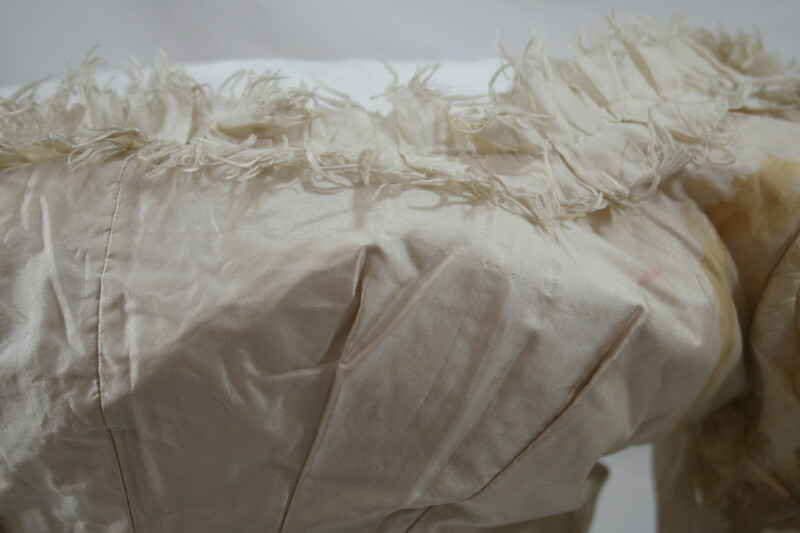 The fitting of the lining- also started with one large piece of fabric that was folded and stitched to fit. 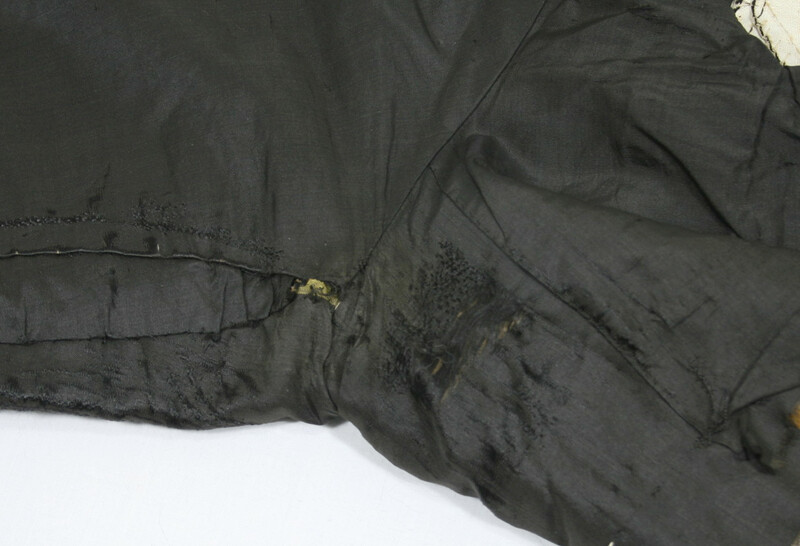 The front of the lining would have been straight pinning shut. Ahh. 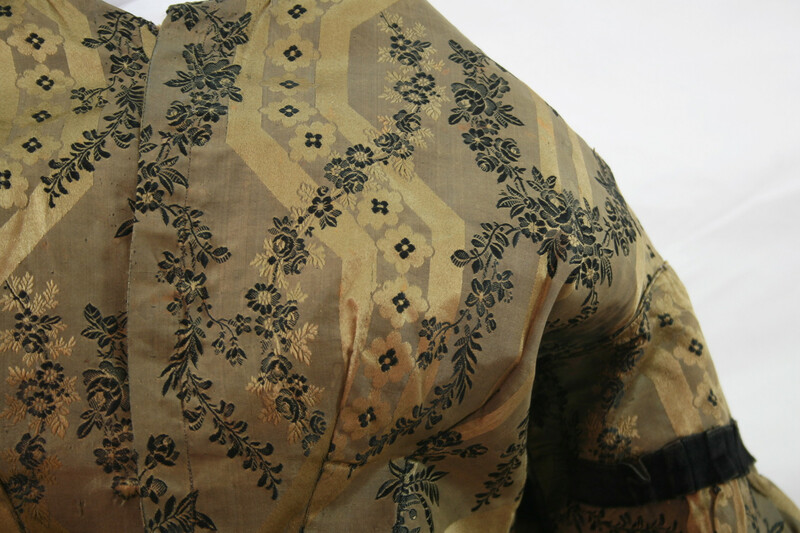 Beautiful lining, and another view of how far into the back the sleeves are set! 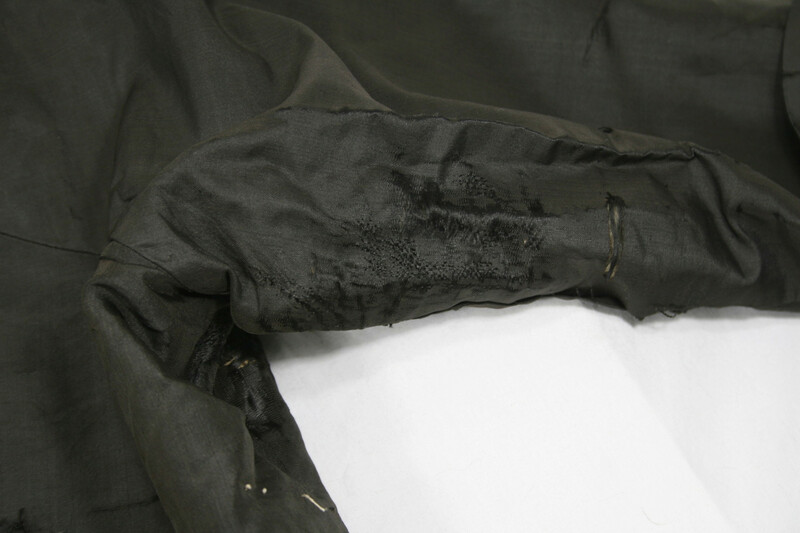 You can also see the stitching line where the fashion fabric ends on the outside. Today’s post is less than the most exciting, but bear with me. My goal is to photograph the entire collection, and some of it is less than exciting. I keep hoping for a nice, sunshiny day, so I can finish off this box of bodices and move to the next storage box- full length dresses! So, we have three random accessories; a partial bertha, a black silk collar, and a silk velvet belt. I am not as sure of the dates on these as I am on full garments. The bertha is made of silk taffeta, silk velvet, beads, and white silk organza. It is lined in more silk. It is mostly machine sewn, with hand finishes. My stab at a date based on the style would be 1890s, but I could be very off. If you have insight (beading is someones specialty! ), please comment below! Here’s a black silk collar. Faced in more black silk. 1″ wide. And a silk velvet belt! The front and back are not proportional. It closes at the side with hooks and eyes, and is boned with 6 bones. This could date from several different periods in the 19th century, based on materials and construction. I would hazard a guess of 1870s-90s, based on the type of boning and casing used, but once again, not sure! Today’s garment is a tiny bodice- about the size of a 5 year old girl. (Yes, I know children vary wildly in size, but… the average size of 5 year olds I know!) 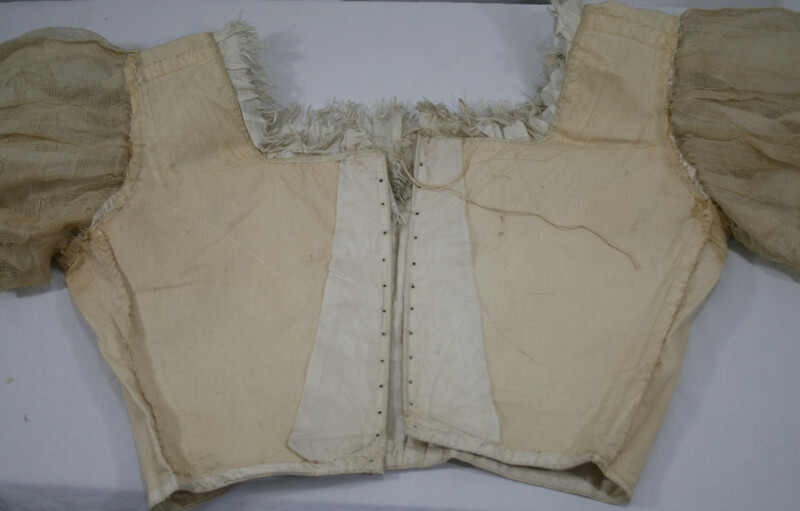 The waist is about 20″, and the bodice is 12″ long. 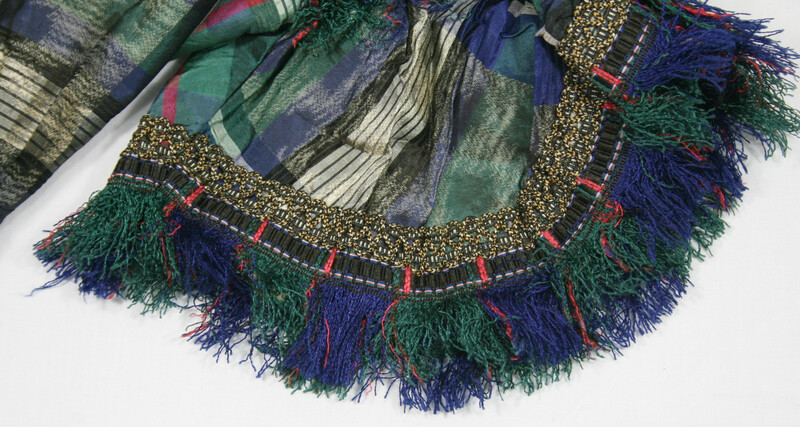 It is made of a fantastic loud plaid silk, with coordinating silk fringe. 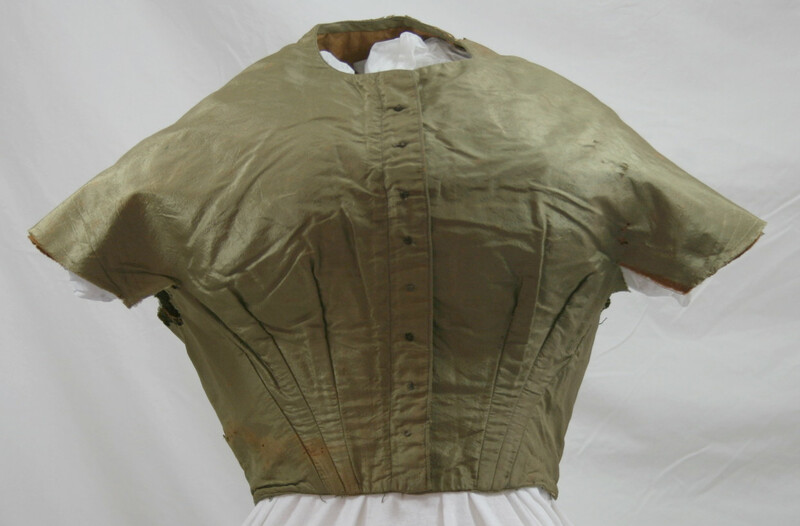 The bodice closes in the back with brass hooks and eyes. 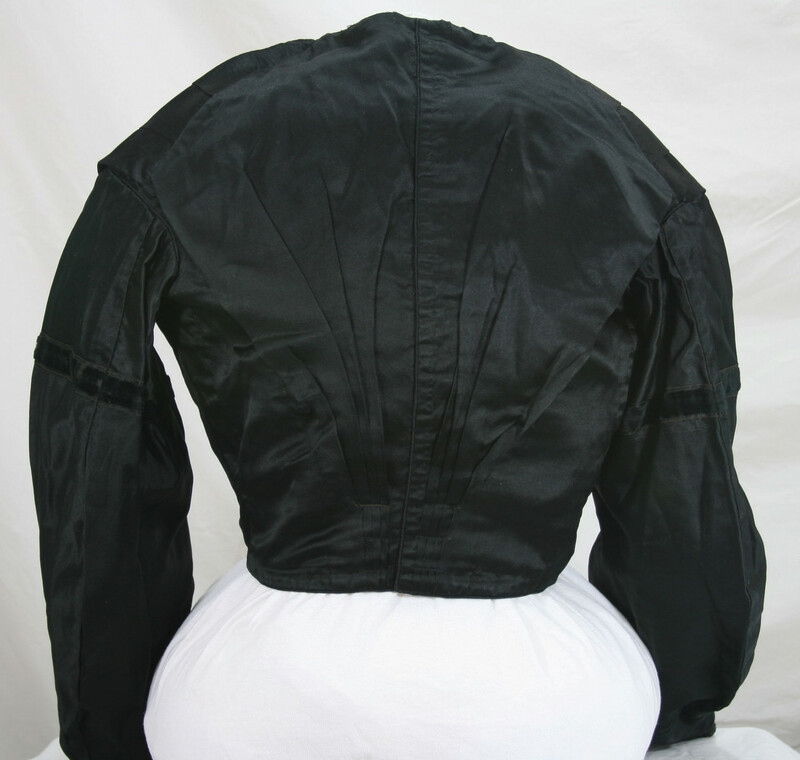 The bodice is yoked, both front and back. Piping finishes the waist, neck, armsyce, and sleeve edge. 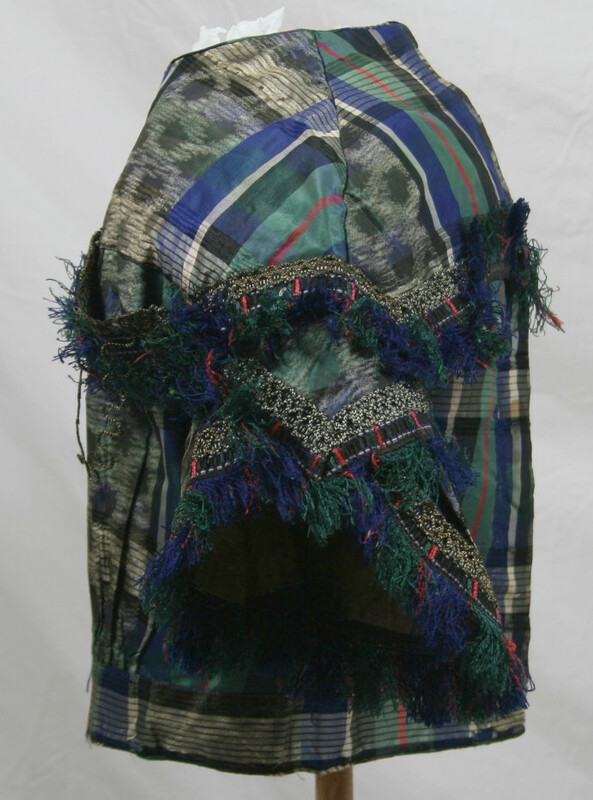 Much of the piping is not easily visible due to the fringe. The short sleeves are created in two pieces. 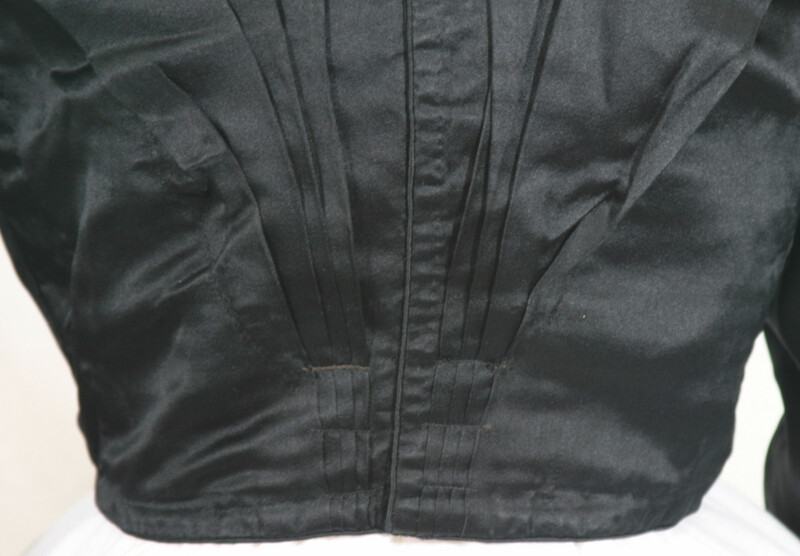 The waist shows the center front gathering above the waistband. 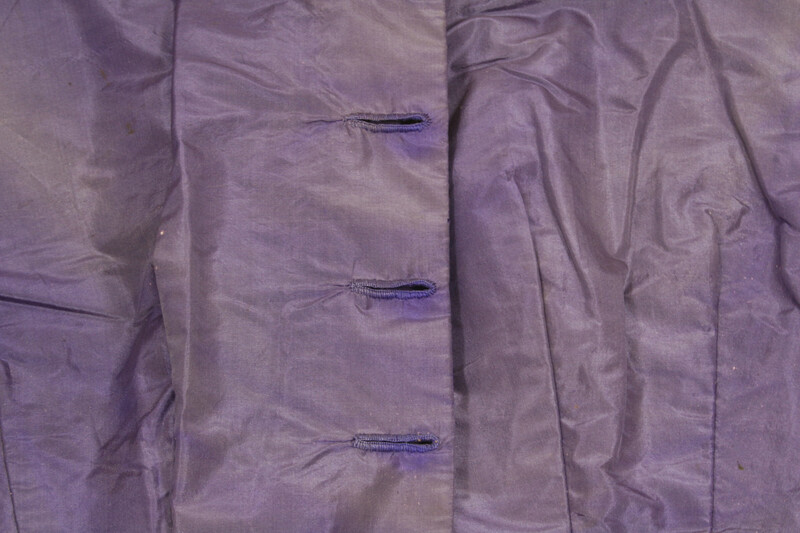 The bodice edge is finished in piping, and the waistband is purely decorative and stitched on top. The sleeve; and a good picture of the trim. 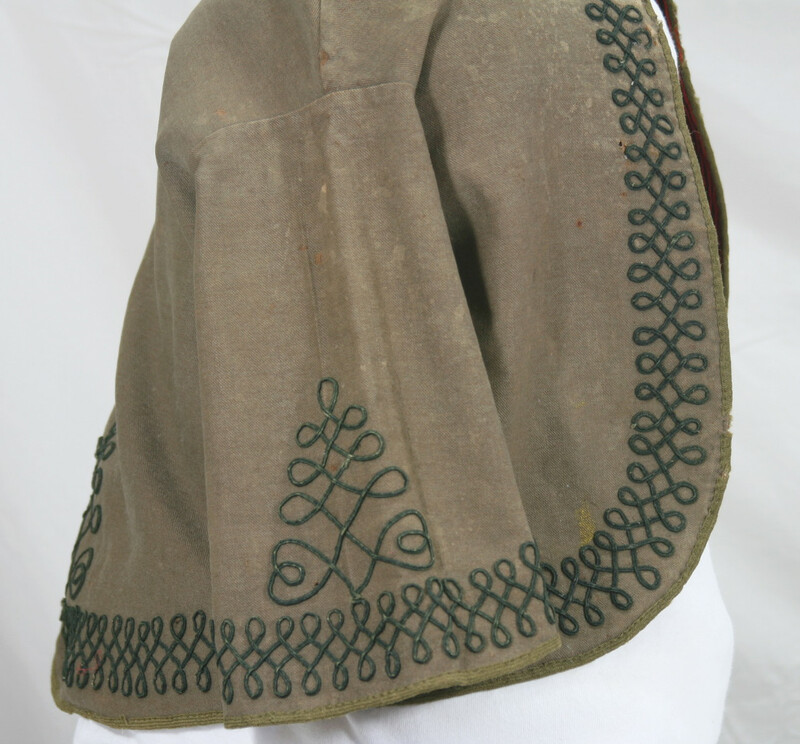 The bodice is handsewn, and lined in a twill weave cotton. 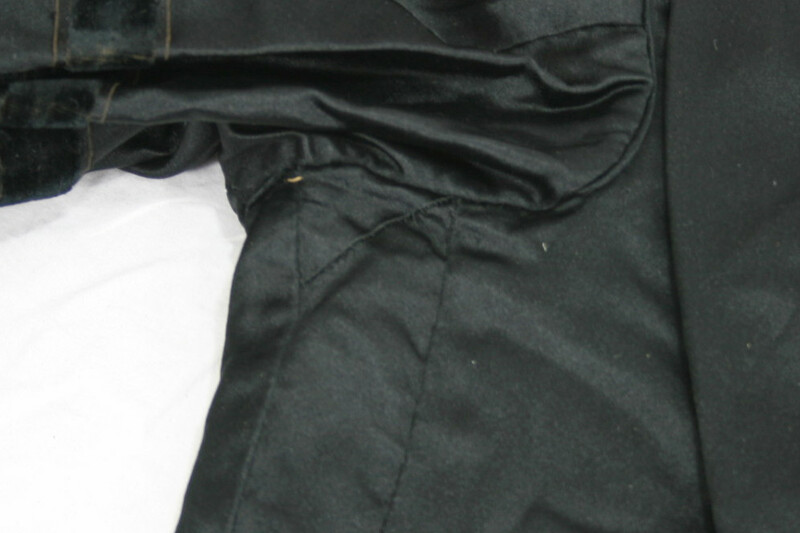 The sleeves are lined with polished cotton. 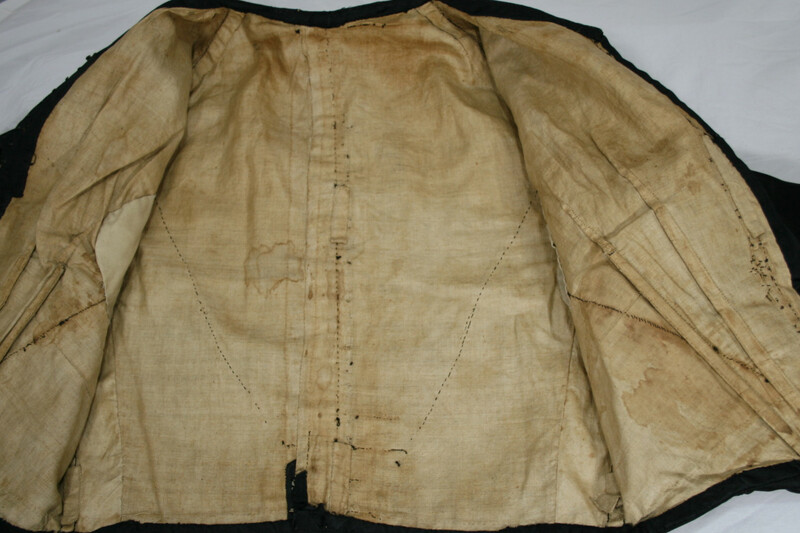 There are three bones in the front of the garment- two are in darts that only appear in the lining, not the fashion fabric, and the center one has been attached via a casing. Today we are going to focus less on the item, and more on my airing of a grievance with people. 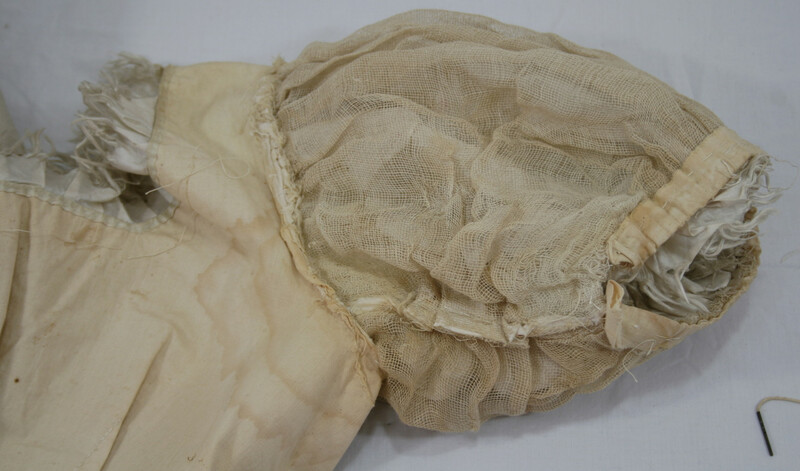 This bodice, circa 1870s, is a perfect example of why we don’t store originals in the sun. I have no idea why the owner who did this damage had it in the sun, but it is very evident they had. 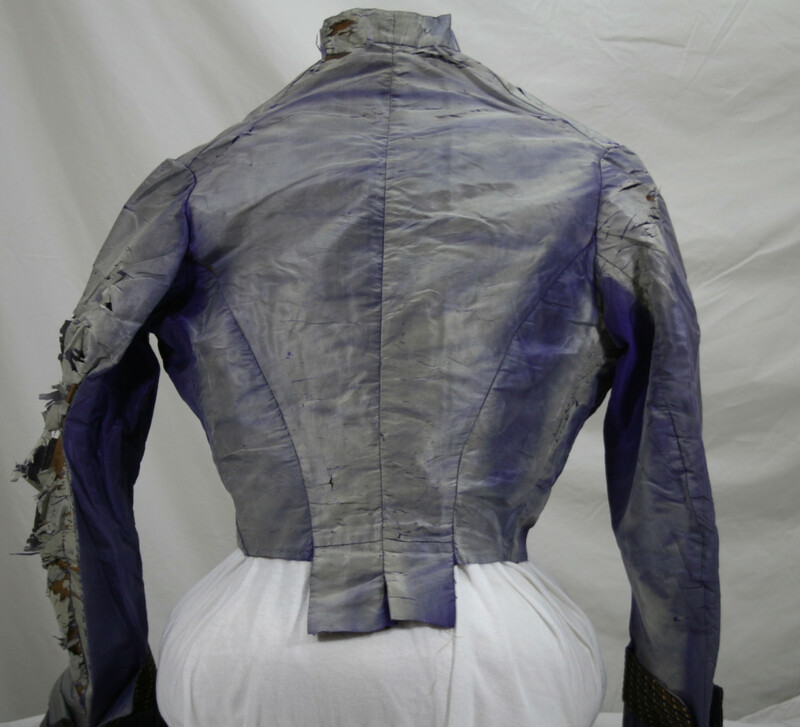 As you can see, the front of the bodice is still a stunning deep purple, while the back is a mostly shattered, nearly white, falling apart mess! Don’t store originals in the sun, kids. Heck, don’t store your modern stuff you want to keep it’s color in the sun either. It ain’t pretty. Nice buttonholes at least! Hey, what about the buttons that go in them? 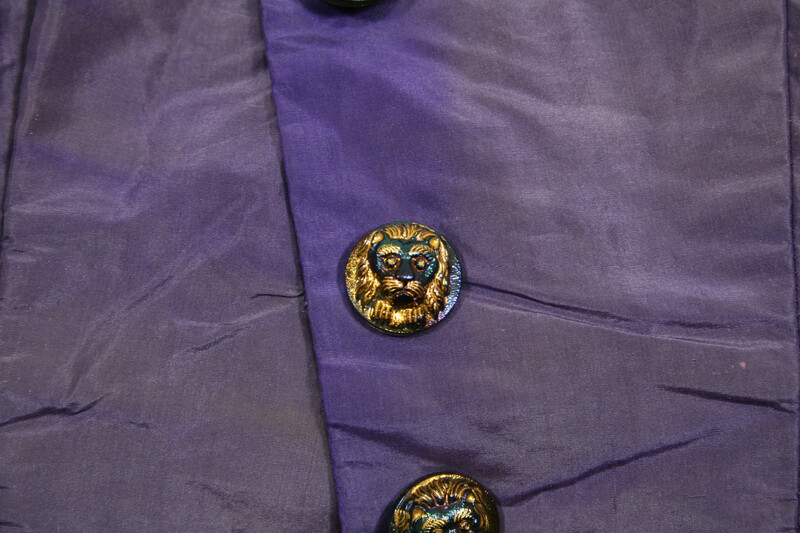 The reason I purchased this poor dear- these fabulous lions head buttons! First, let me apologize for missing two days of posting. I’ve been swept up in holiday preparations, and haven’t had the chance to sit down. Today’s garment is mainly for construction details, as there is not much left to it. I hesitated to put it on the blog, but, as the goal of this project is to get everything documented and photographed, went ahead with it. I also want to let you know that yes, I do own full dresses as well, I am just working through a stack of bodices and other short things! The fabric is a shot silk, and thus a bit tricky to photograph. The sleeves have (obviously) been removed. The bodice is fitted with 6 front darts (I would love to perfect this fit on myself. I have a hard time getting those 2 extra darts in there.) The darts are boned, as well as a narrow boned channel next to the eyes. 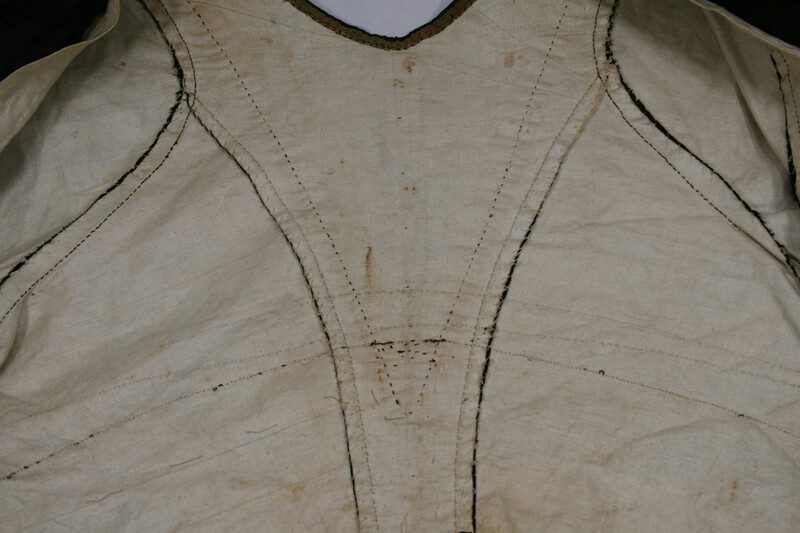 There are thread spots from where the bodice had decorative buttons, but it closes with hooks and eyes. The bodice is almost entirely machine-stitched, including the top-stitching on the tuck for the three-piece back. 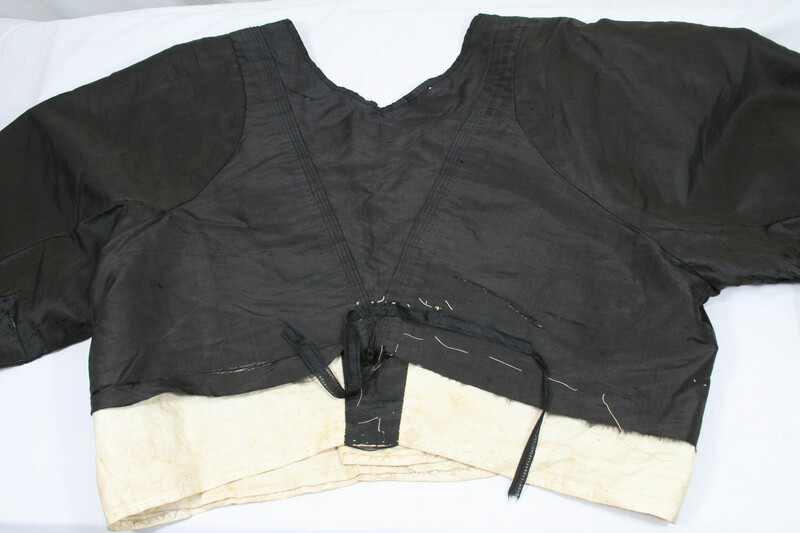 (While some bodices are true three-pieces, having a false seam that makes it appear to be three pieces is fairly common as well.) 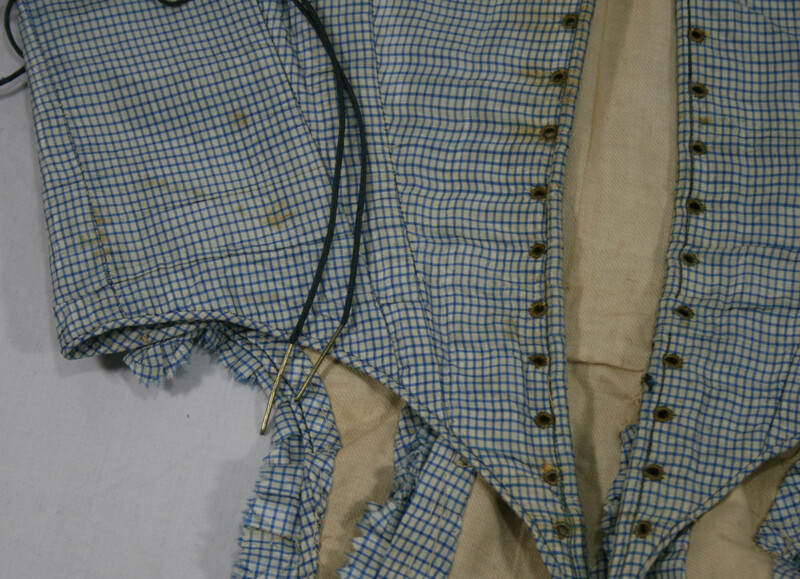 The bodice is piped at neck, waist, and shoulder seam. 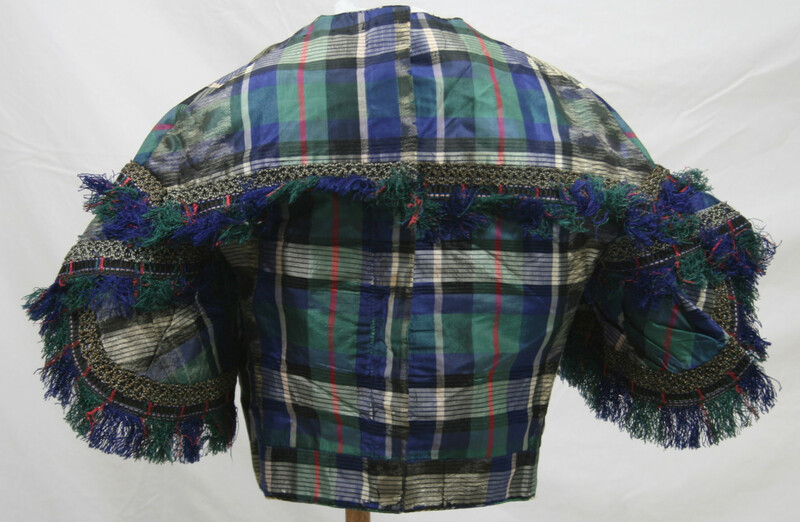 The armsyce was likely piped as well, as that is almost universal on 1860s bodices. The inside is lined with a twill-weave polished cotton. Examining the stitches on the inside shows they were chain-stitched, not lock stitched. 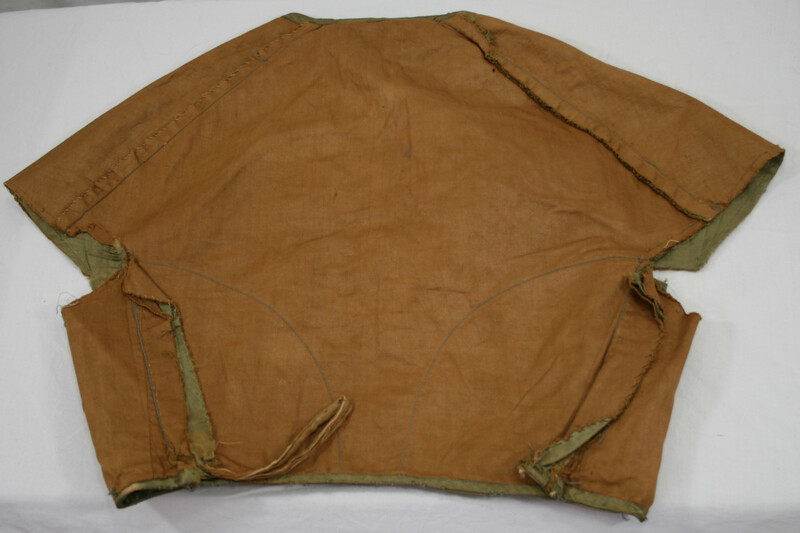 A cotton loop remains attached to the waistband, likely for hanging the garment for storage. 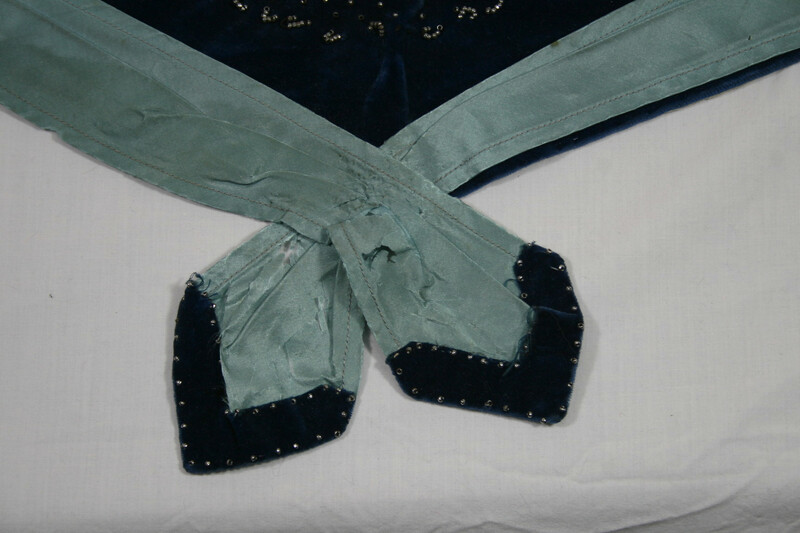 A hook also appears mid-waist, likely used in the fitting/close of the complete dress. Among what is hand-sewn includes the bone casings, the overcast finish on the piping, an overcast edge to the seam edges, and the attachment of the hooks, eyes, and buttons. 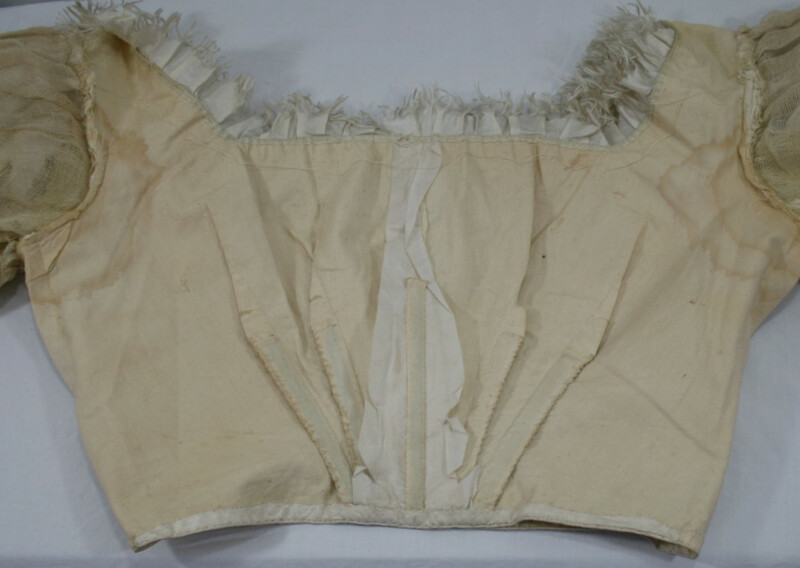 The bodice has a 26″ waist. 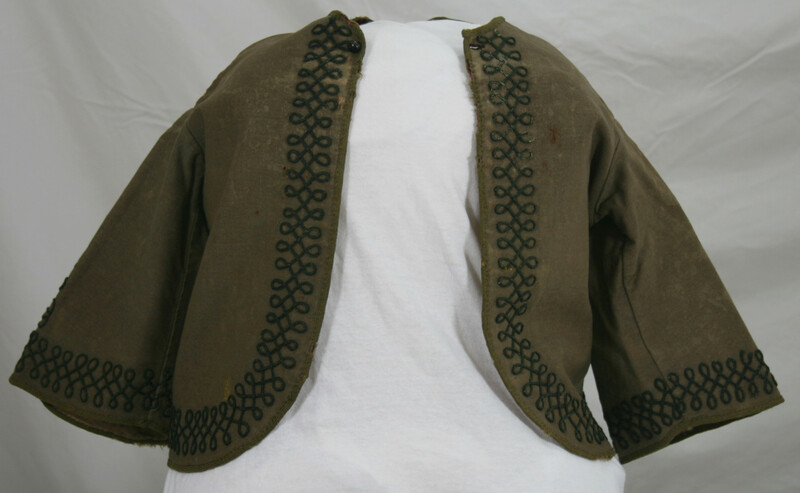 Today’s item is a sweet little “zouave” jacket. It is quite warm, being both made of wool, and lined in wool. 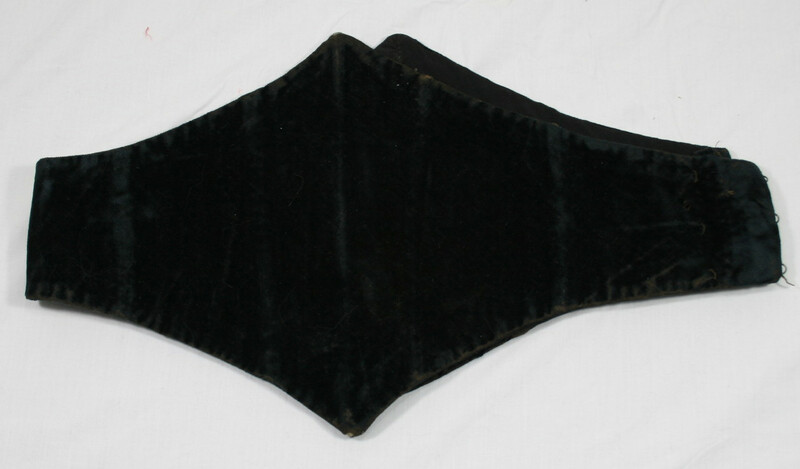 It is 16″ long, and trimmed with wool soutache. 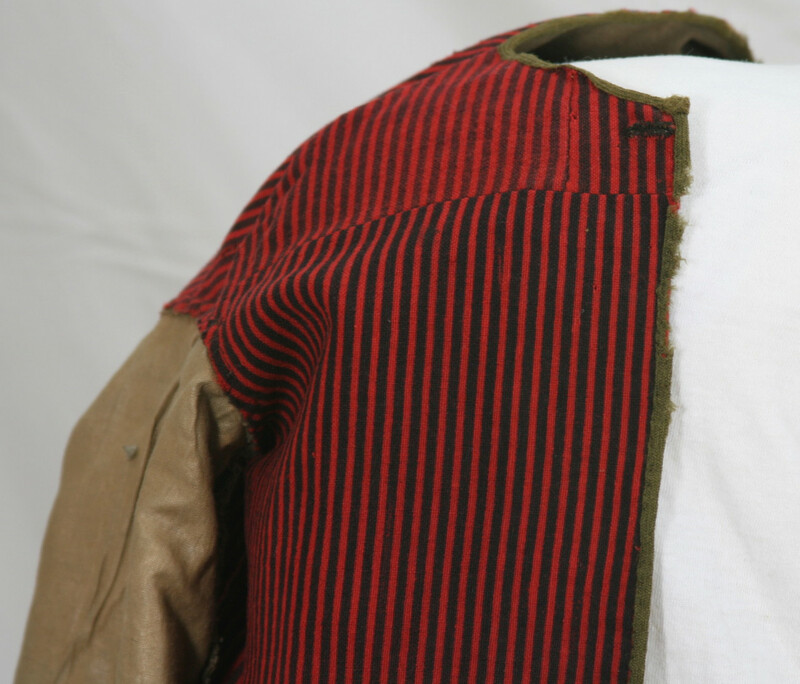 The wool lining is pieced, and the sleeves are lined in polished cotton. The jacket clothes with a single button. 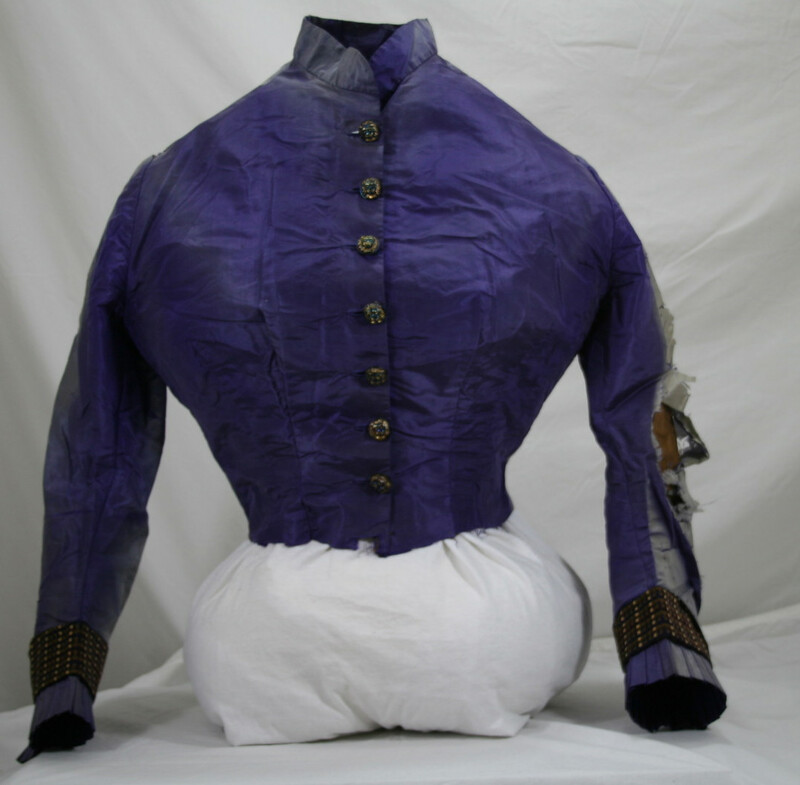 Today’s bodice dates from 1825-1835. 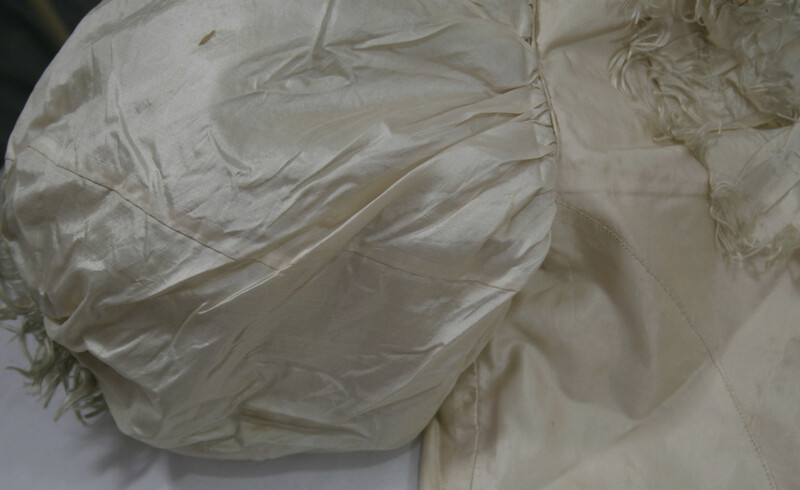 It is made of white silk, and closes in the back with lacing. 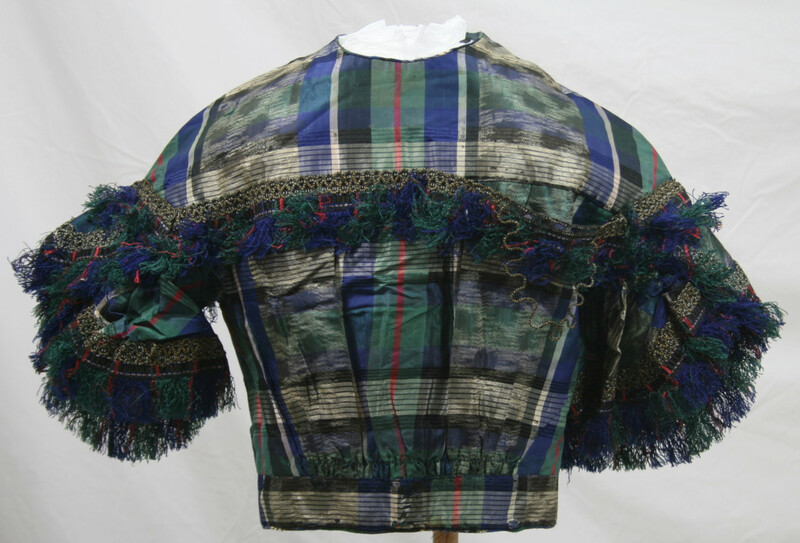 It has very puffy short sleeves and self-fabric fringed trim. 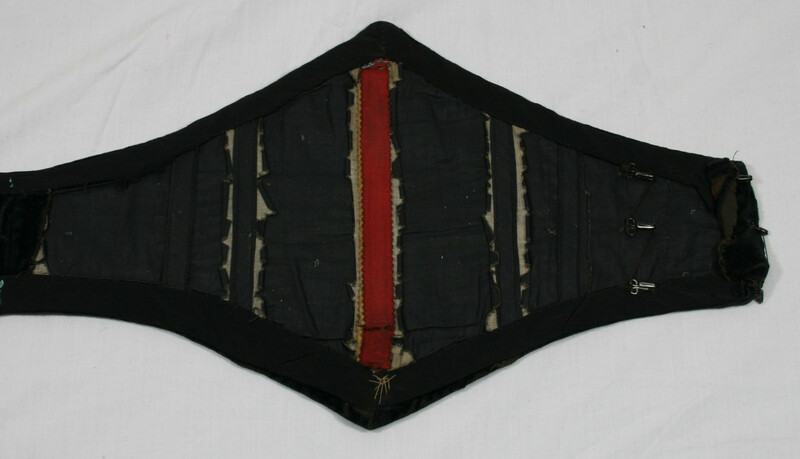 The waist is about 23″ fully laced. It was likely an evening dress. 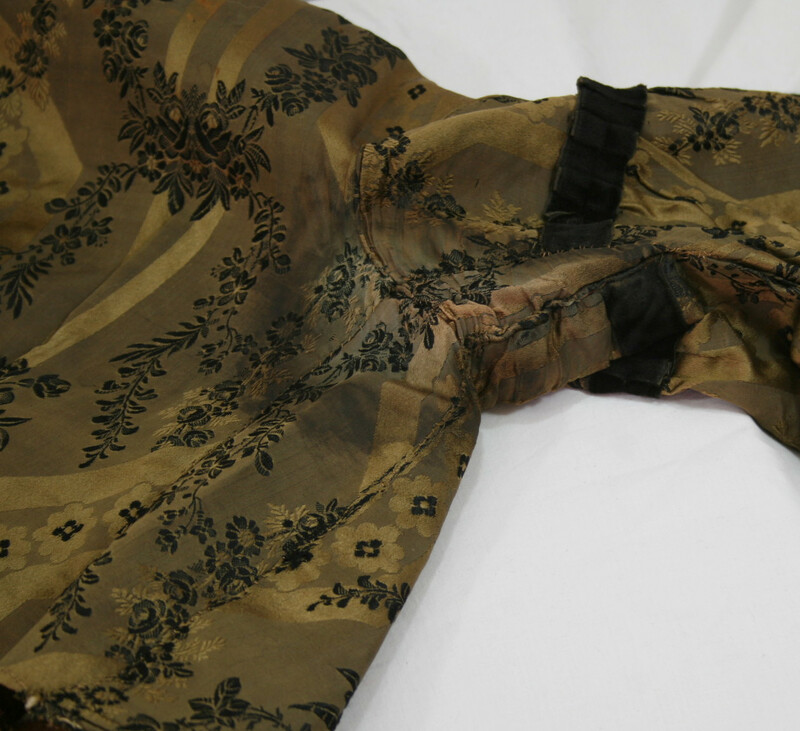 The original lace is present, both to close the back of the bodice, and in the neck casing. 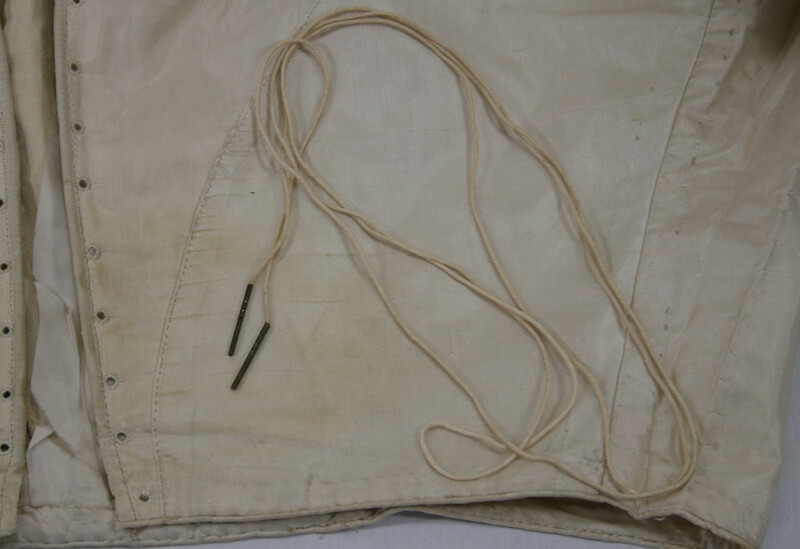 Both are made of cotton cord, and the back lacing is finished with 3/4″ aglets. The sleeves are cut on the bias, and both are made of two pieces (used to have enough fabric, not a style element). The underarm sleeve seam is slightly pleated/gathered to increase pouf. 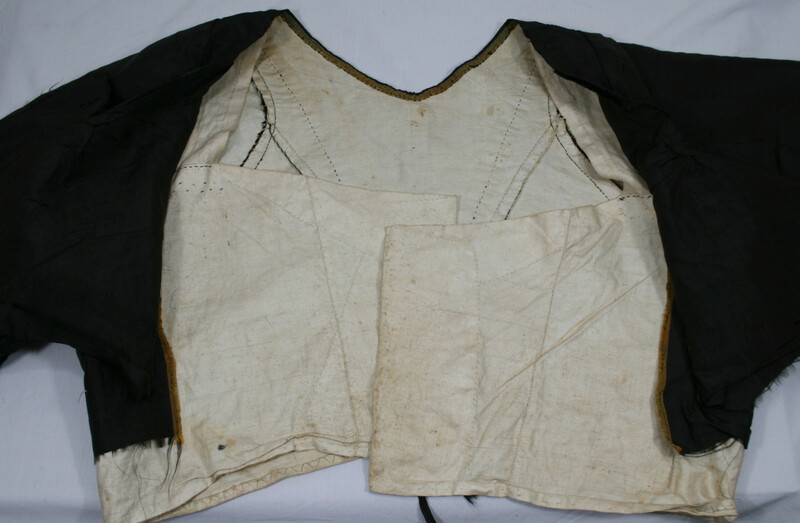 The bodice is in remarkably sturdy condition, so I have been able to turn it inside out to get a full view of the construction. 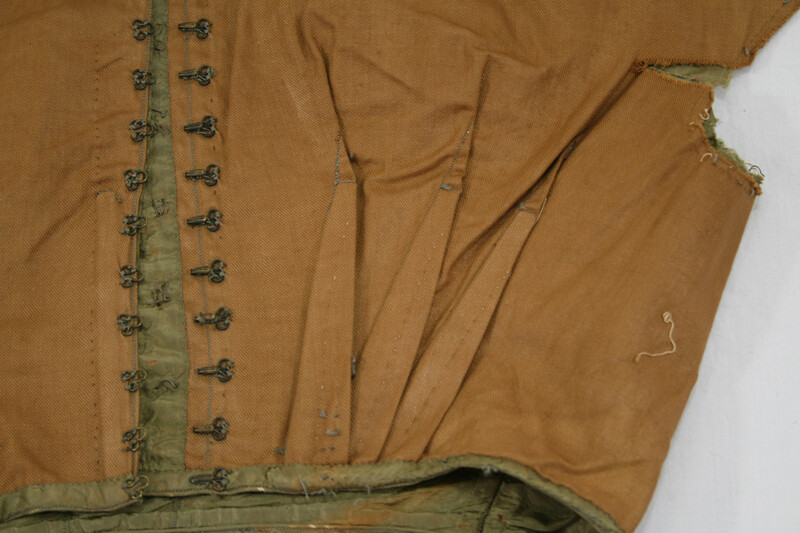 There are five whalebones used in the front of the bodice, and the back opening is strengthened with reed. The waist and the armsyce are finished with piping, and the neck edge is finished with a narrow casing. 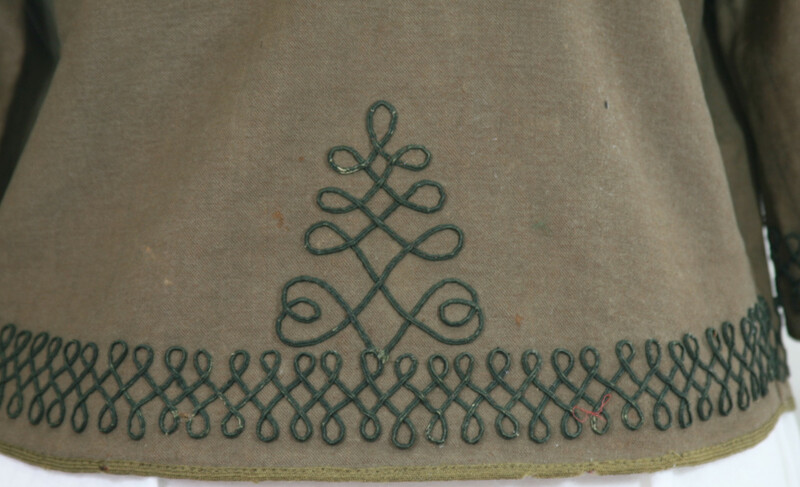 The sleeves are fully lined in cotton net. Please note, the cotton band at the bottom of the sleeve is not original to the garment. 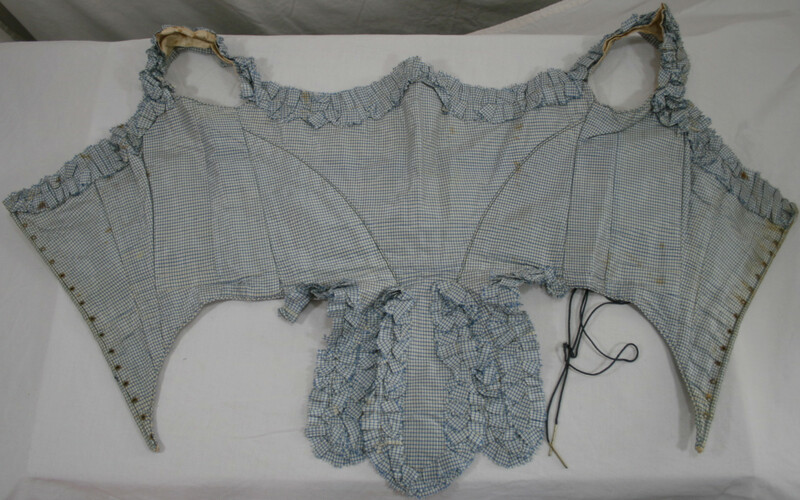 Sadly, this bodice had been used sometime in the 20th century as a costume. This is the only alteration I couldn’t safely undo, as they had caught fringe bits in their stitches. 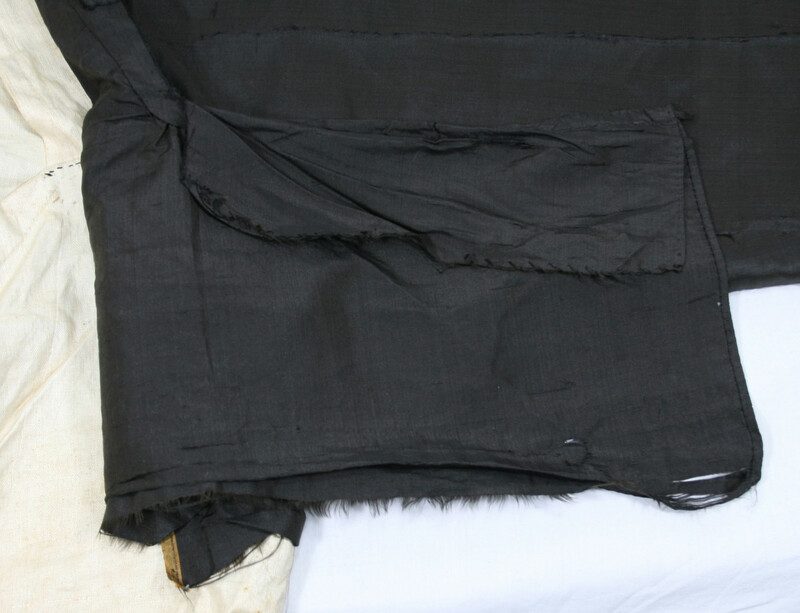 The edges of the fabric at both center front and back are folded unevenly, to give a better fit. There are also darts taken in the back of the bodice to get a closer fit. Yesterday we were rainy and overcast for all the daylight hours, which means I missed a day blogging. I have so far been photographing the object the day I post it; mainly so the garments stay in their storage until it’s their time to be handled, and to reduce chaos. 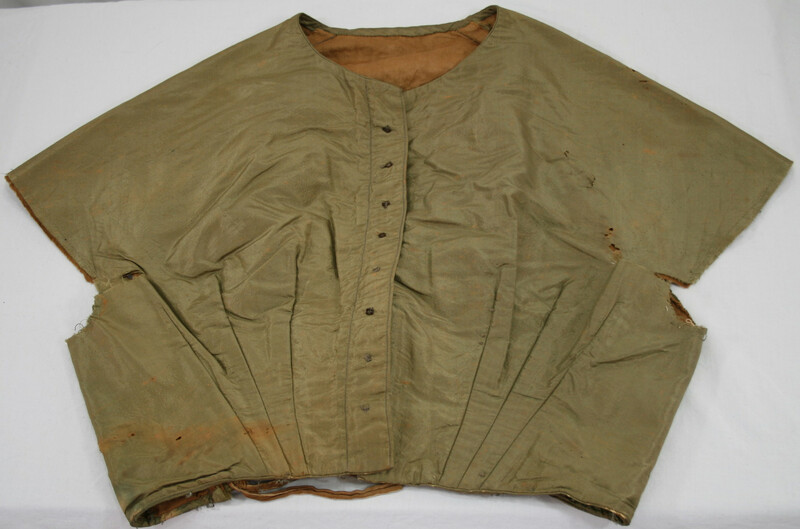 Today I pulled out 4 bodices, so I have a few ready for the next rainy day. 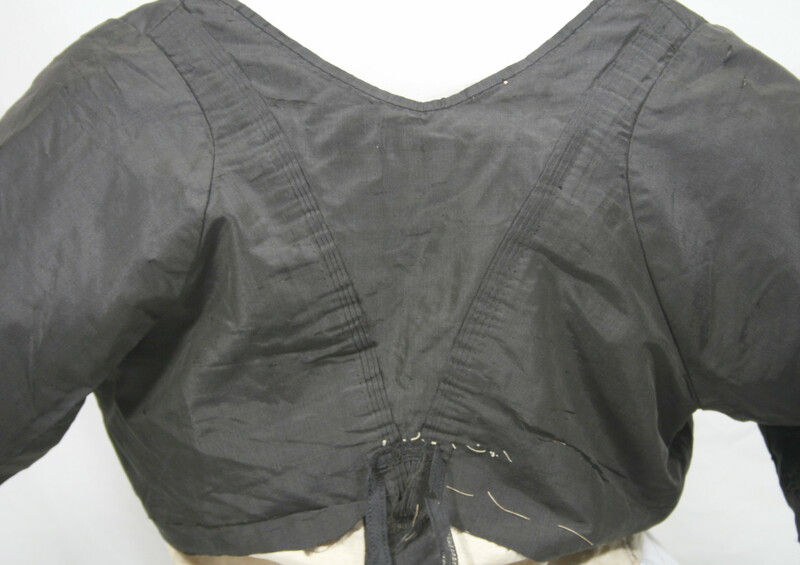 Today I present an early 1850s black silk satin bodice. Satin! So delightful! 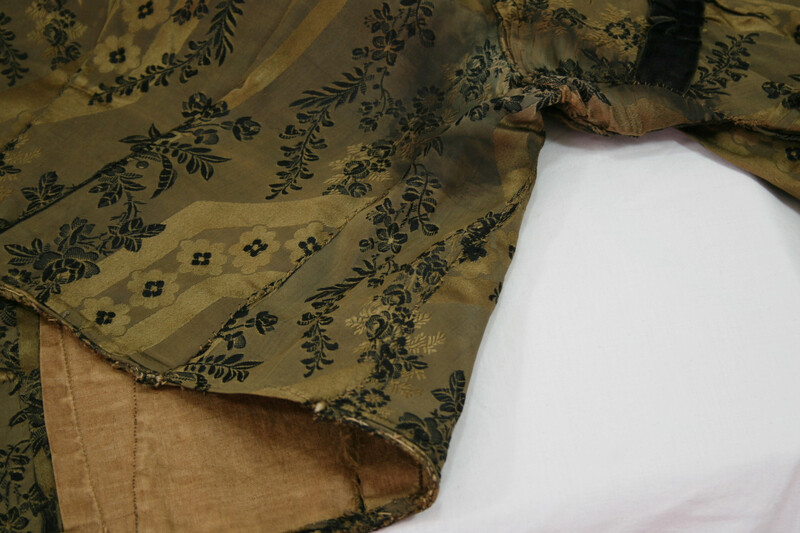 The satin is in very sturdy condition, but the trim, a silk velvet, is in terrible condition. For this reason, she is a delicate-handle bodice, and I was not able to get as many construction images as I would like. 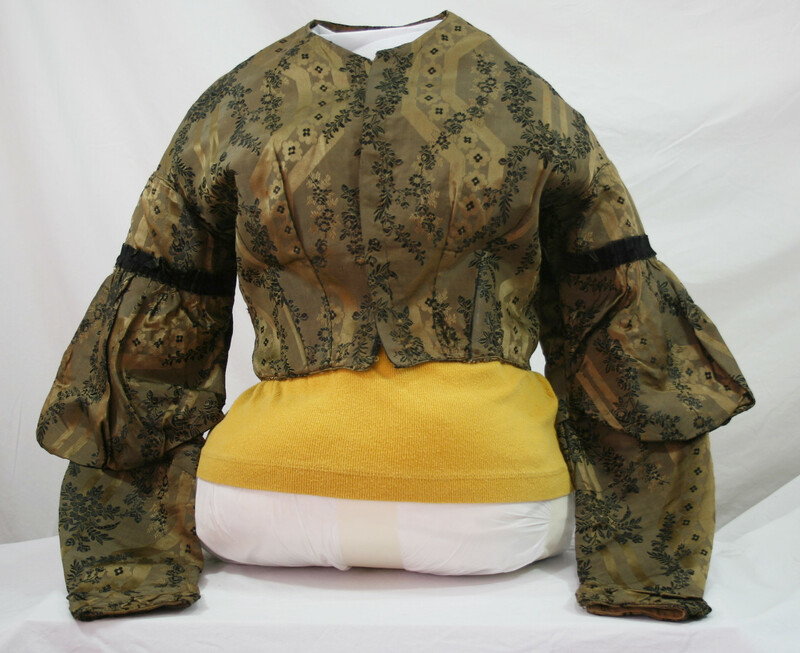 The bodice is fan-front, closing with a combination of hooks and metal eyes and thread eyes in the center front.The bodice waist has a gentle dip at the center front. 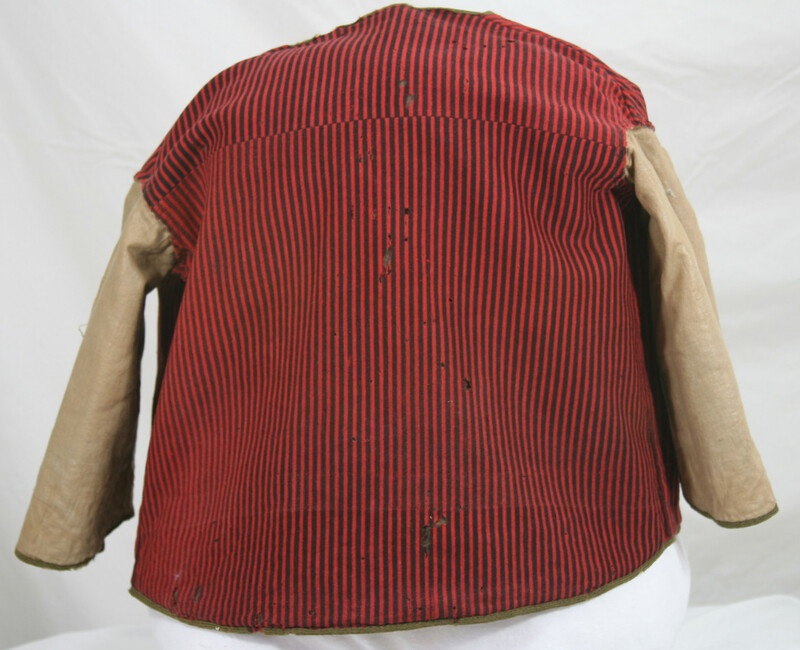 The sleeves are a very narrow coat-type sleeve, that was popular in the early 1850s. The pleats, which you can see where they are tacked down, would have originally laid a bit neater than they appear now. The back, and yes, it is actually slightly crooked- it’s not just the form and photography. The right shoulder seam and the left do not perfectly align! Detail of the back fans. Detail of the front, open. The bottom eyes are metal, while the top are thread. Note the side front seams, crucial for achieving the fit of a fan-front. 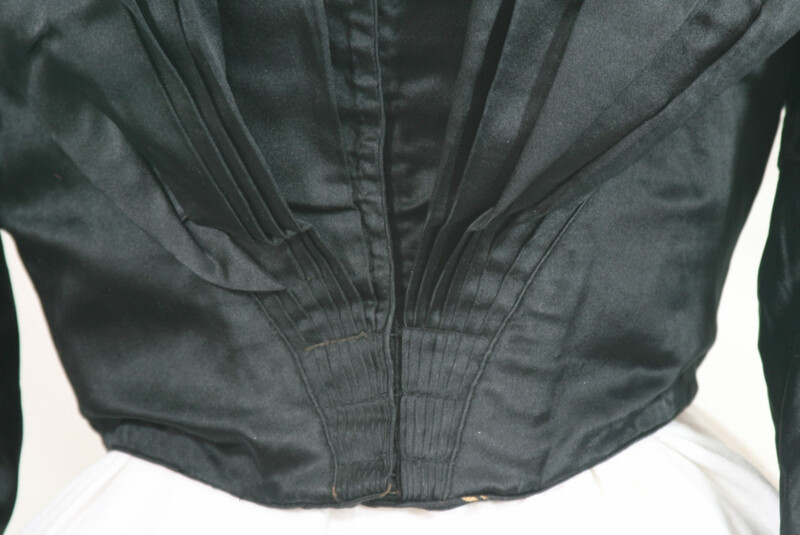 The waist on this bodice is 27″. Inside, the best we can get. 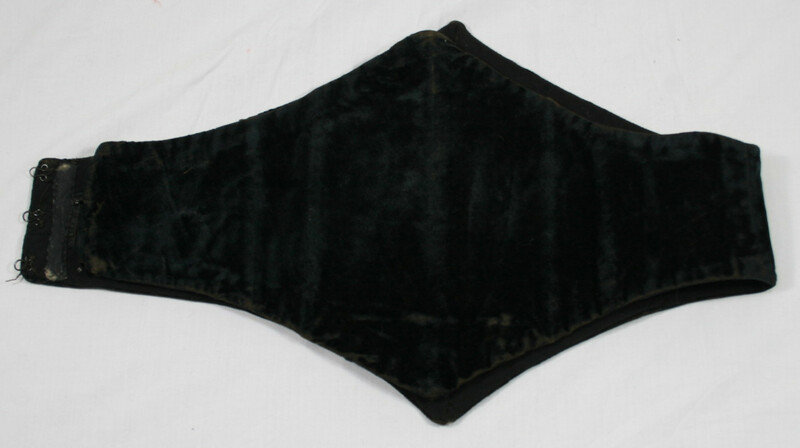 The lining back is two pieces with a center seam, and only one dart on each side is boned. 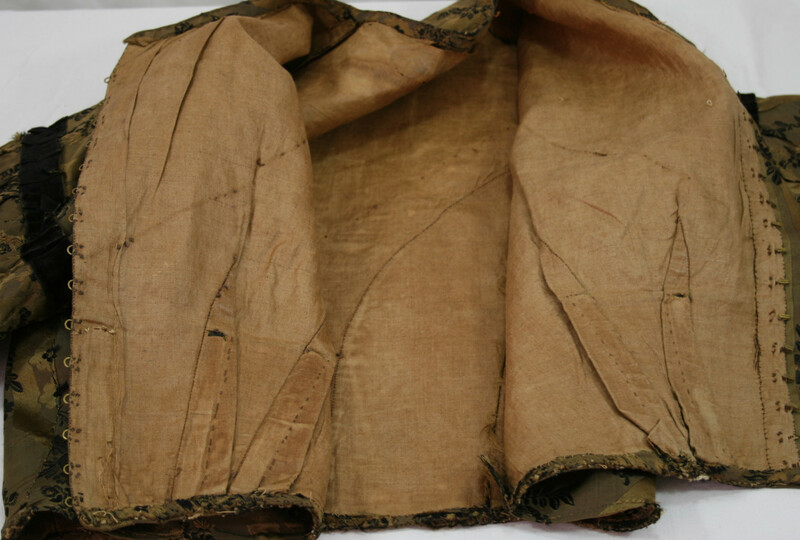 There are three casings in the lining- one on each side seam and one on the center back line. I do not know what these were for. Under one sleeve in the side seam there is a teeny triangle pieced in. 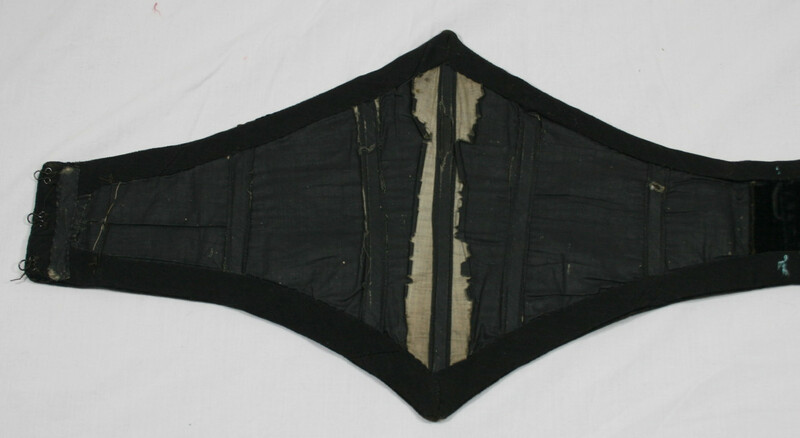 Today’s item is a mid-1860s Swiss Waist, of very tiny size, thus, no form for her. 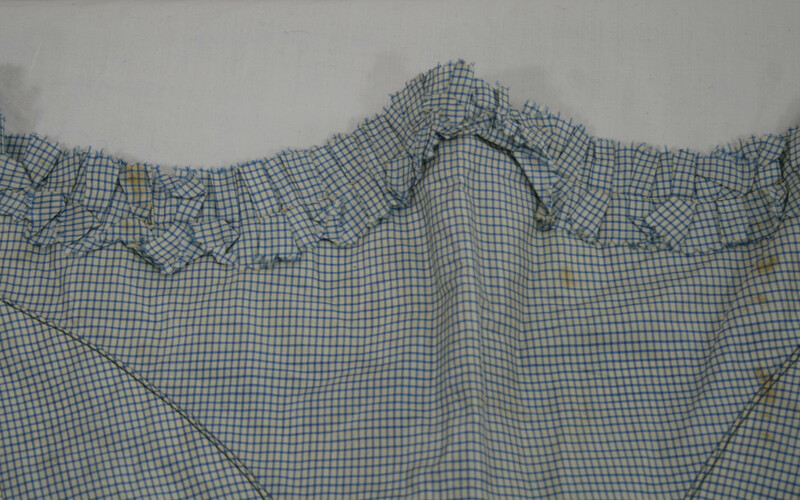 She is made of silk blue and white gingham check, lined in cotton, and trimmed with self fabric. In the reverse, she has three tails, trimmed in self fabric. So cute! The waist laid out flat. 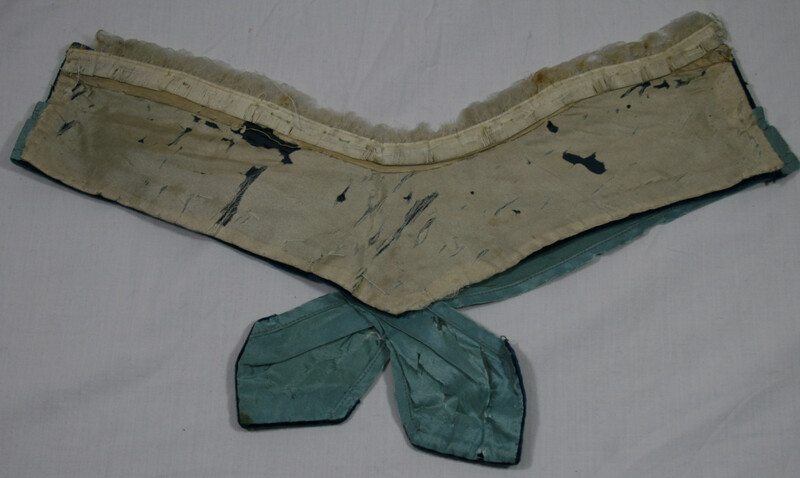 A waist of this style was likely worn with a very fashionable silk skirt (possible of the same material, or more likely, a coordinating fabric), and a fine white bodice. 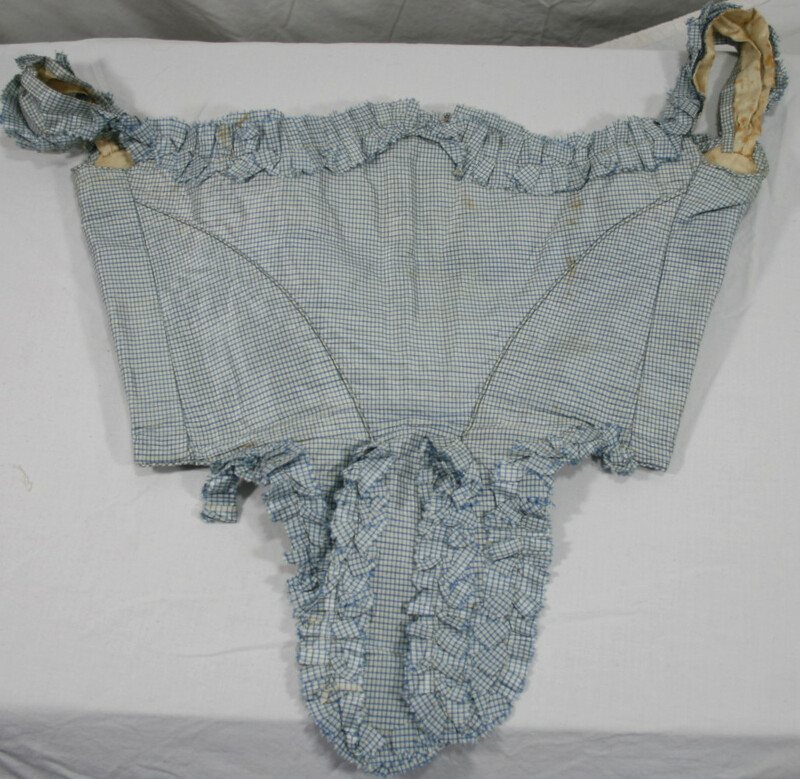 These were primarily worn by the fashionable and more well-off persons. The size of this one would indicate it was likely worn by a teenager. She is made of a combination of machine and hand sewing. 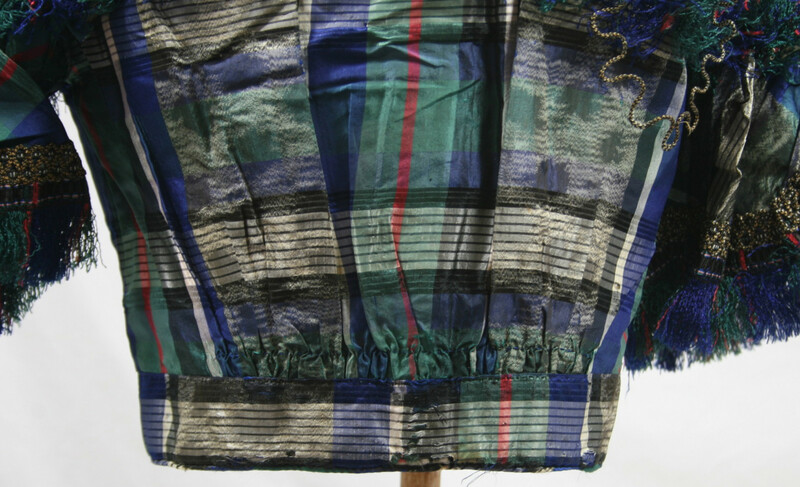 The top and bottom edges are piped, which the tails being finished with a self-fabric facing. The darts and side seams are boned, and the center front is strengthened with reed. The edges of the trim are pinked. 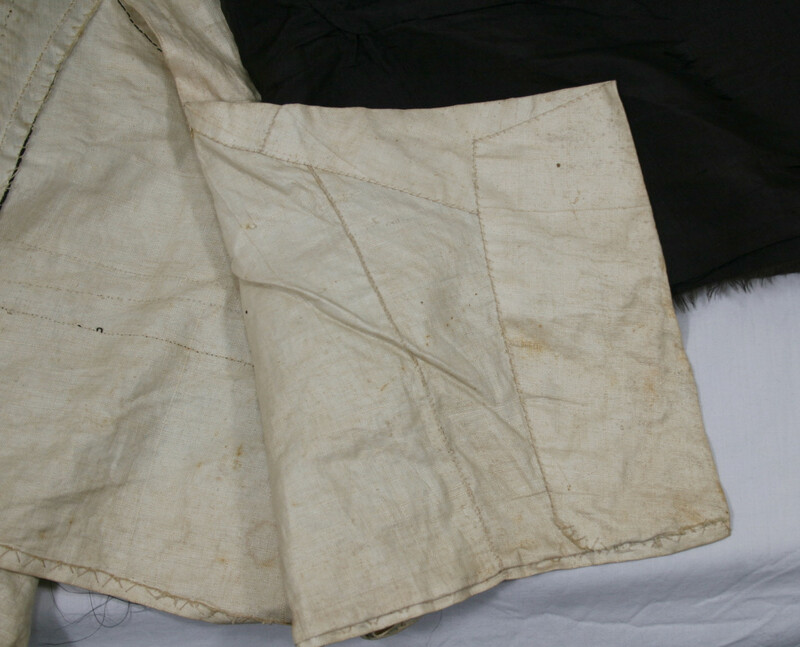 The back seams appear to be piped, but it actually a fold of the fabric stitched to resemble piping. 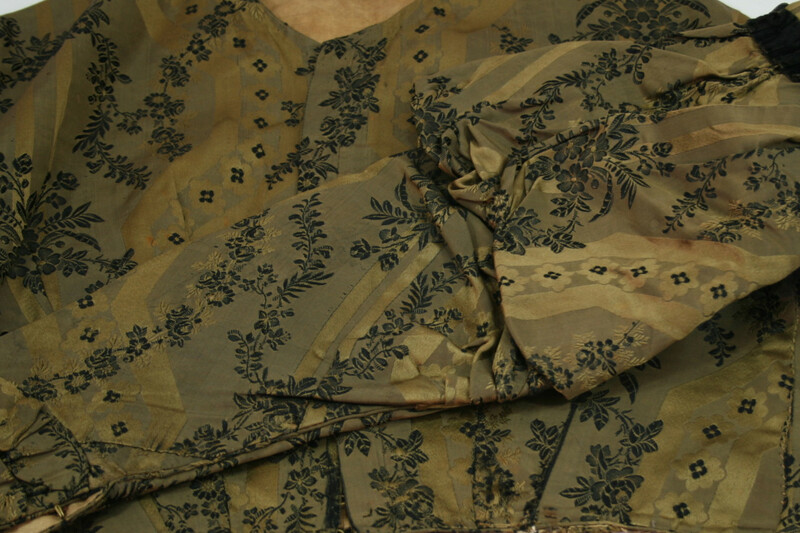 The resulting fold is the same thickness as the piping elsewhere on the waist. The eyelets are hand stitched. 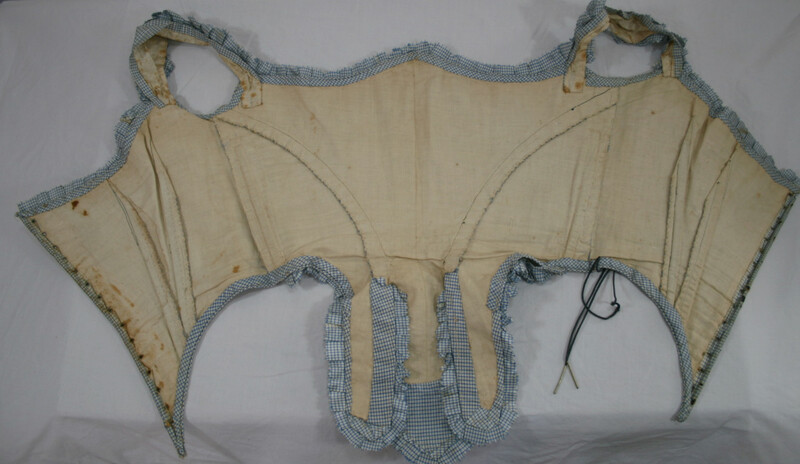 This little garment would have a 19″ waist and a 28″ bust if laced fully shut. 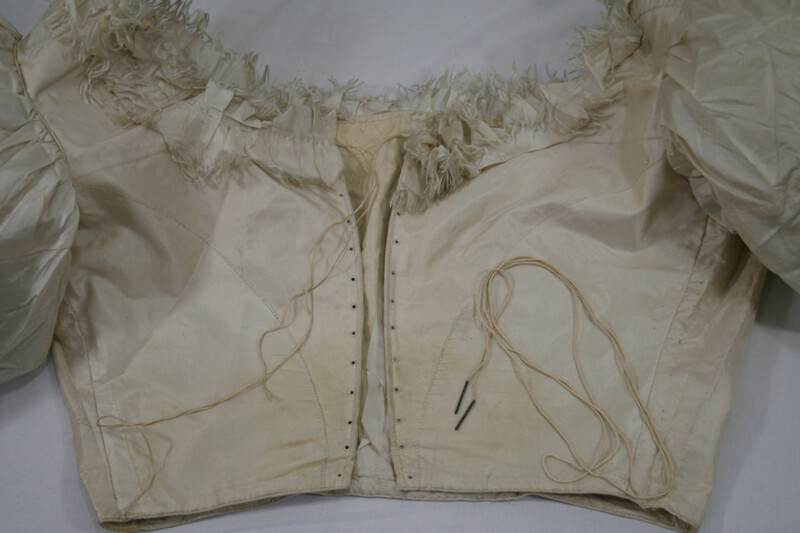 The bodice has it’s original lacing with it. 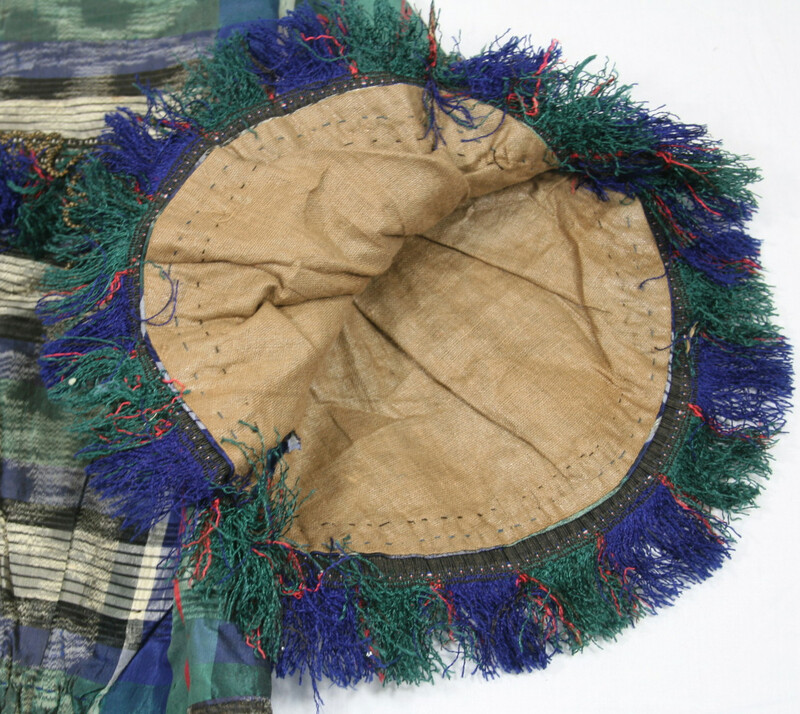 It is made of a silk cord with a cotton core, and is blue. The aglets are 1″ long and taper at the ends. On a side note, another project down the line for me somewhere is to start taking patterns off of some of my originals. This has always been one I’d like to make up! The first of many garment images! A friend has loaned me their camera; combined with some time off for the holidays, and having the spare bedroom to myself for awhile, I am in business! Please feel free to add comments for what aspects of garments you like to see, and I will keep that in mind for future photo sessions! 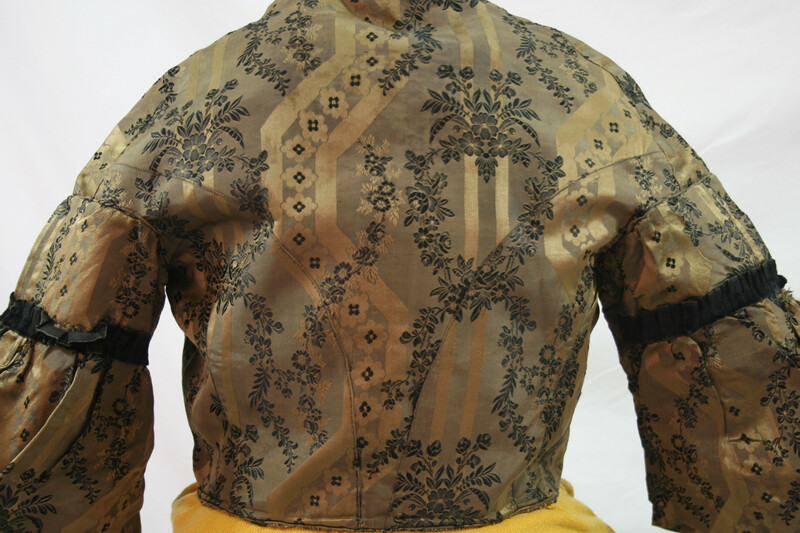 The bodice is made of some of the yummiest silk brocade I’ve ever seen. 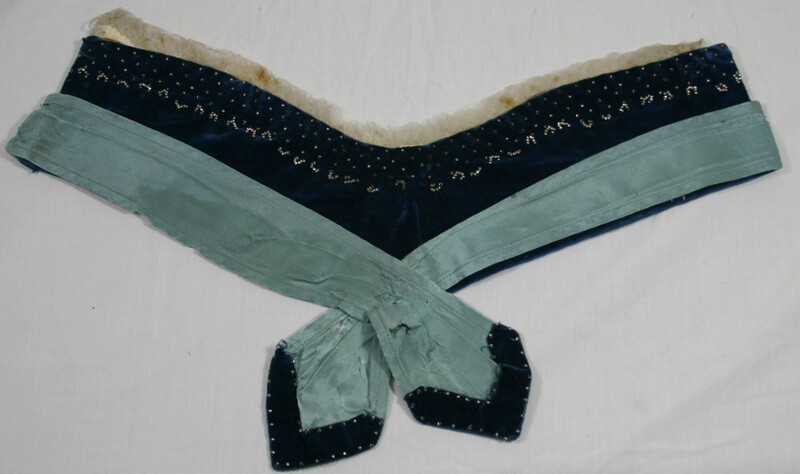 It has a typical bodice structure for the mid-19th century; darted to fit, jewel neckline, 3 piece back. Her personality comes from the fabric and the sleeves, as well as some very creative alterations. I date this dress circa 1859-1861 due to the sleeves. They appear with the most frequency during that time frame. 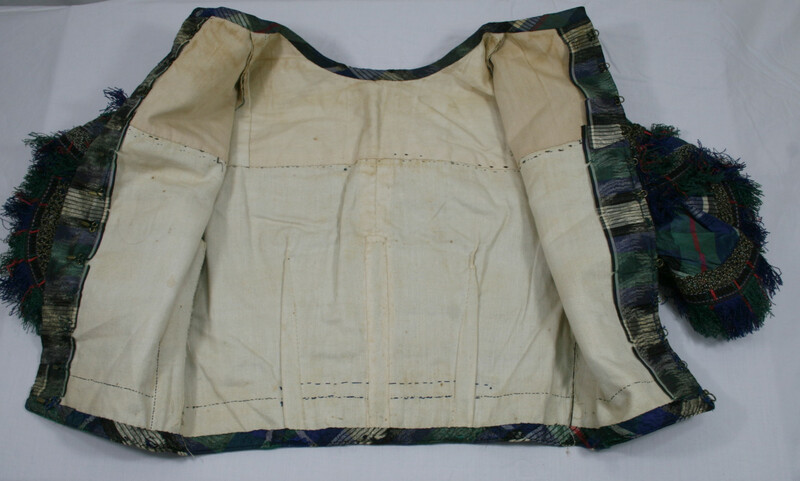 Despite the even and steady nature of the stitching on the front of the bodice, this bodice is entirely handsewn, frequently with very thick cotton thread. 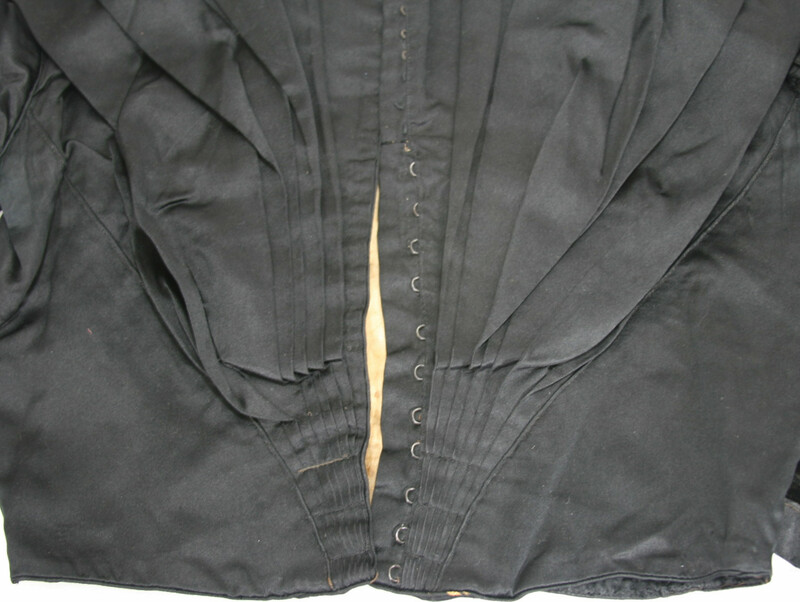 The bodice is piped at waist edge, neck edge, armsyce, sleeve seam and sleeve cuff. The true three-piece back is top-stiched with more very fine stitching. 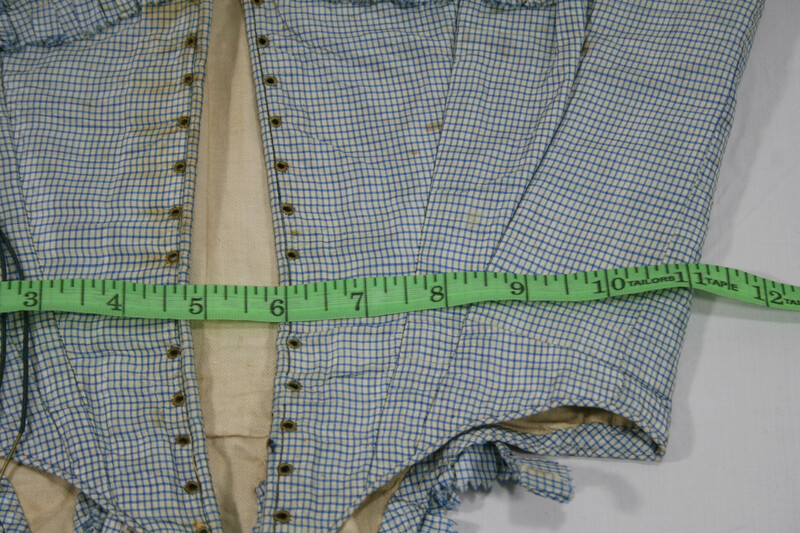 Under each arm, the bodice has been altered to a larger waist size. 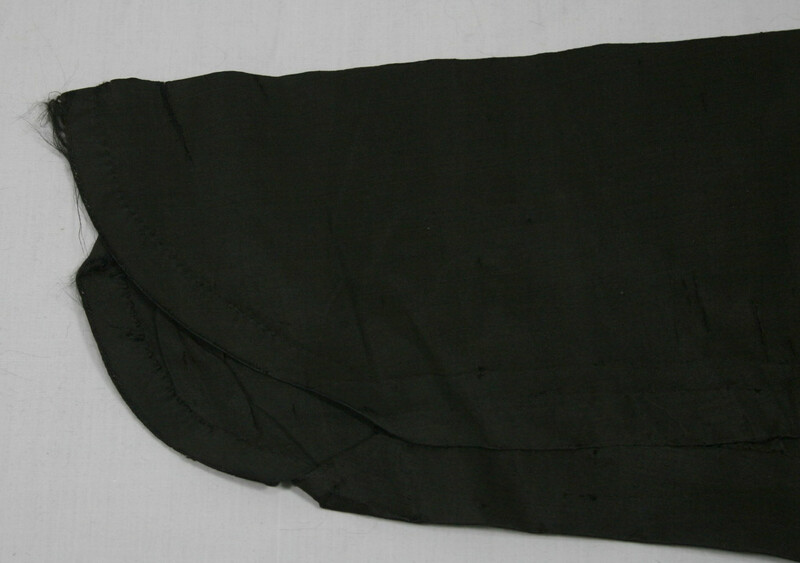 The side seam has been split, up to about 2.5″ into the under side of the sleeve. A gusset has been whipped into the sleeve, and a rectangular panel has been hastily put into the underarm. 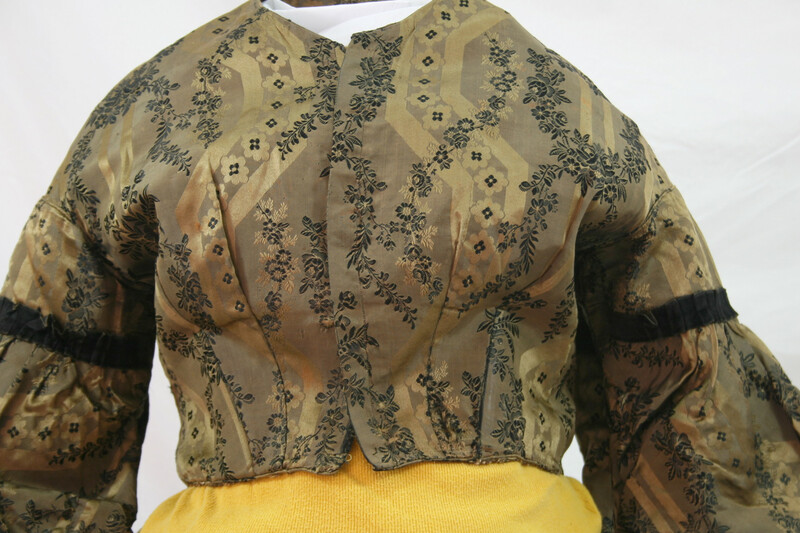 The waist of the bodice is currently about 32″. It would have been about 26.5″ before the alterations. Our slim sleeve features a puff and cap at the top. The cap has been trimmed with pleated silk velvet. 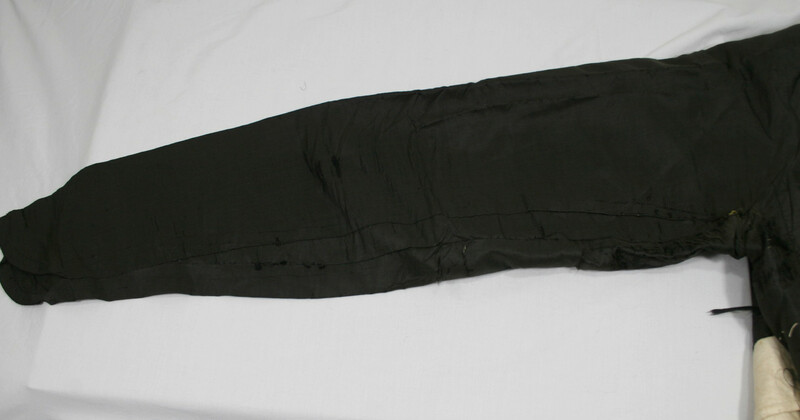 The slim sleeve is slightly gathered on the underside of the sleeve only (seen above). 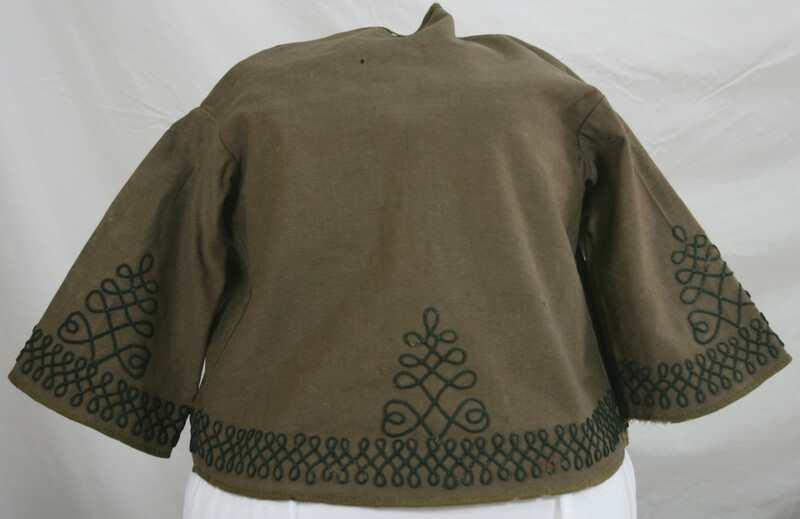 There is piping running the length of the sleeve, and there is self-fabric trim at the cuffs, which close with a hook and eye on each. If you look near the cuff of the sleeve, you will notice a small triangle of piecing. This is pieced on both sides in the same place. A view of the hastily whipped in panel from the inside. 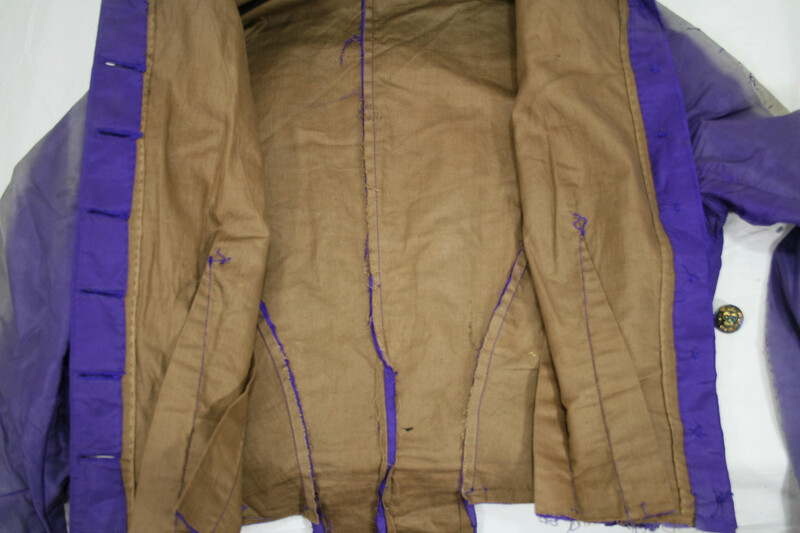 As you can see, there is no lining to the alteration, and the waist piping was not re-done to fit the expansion. 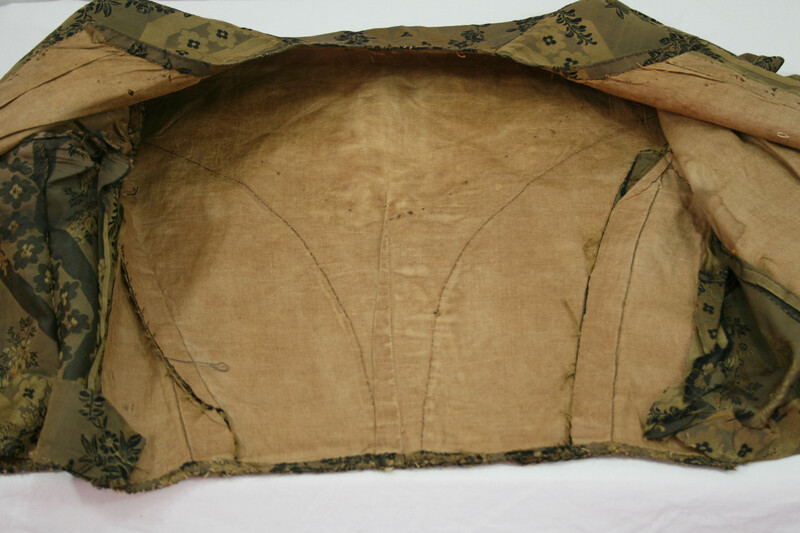 The lining has a dart in the center back, and interestingly shows picked out v-shaped stitching (on both back and front), as if though the bodice had additional trim at one point. The outer silk shows no evidence of this. 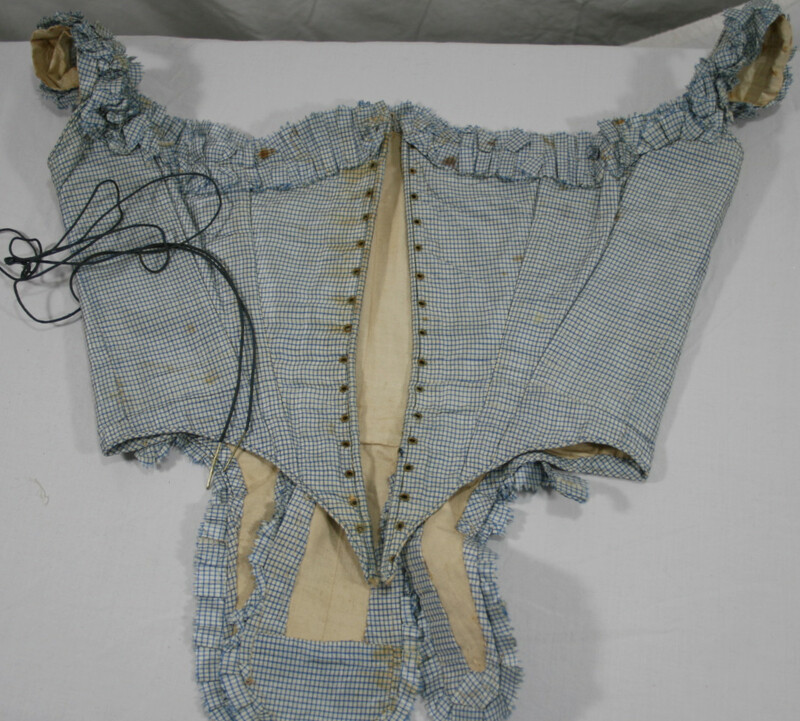 The bodice closes with brass hooks and eyes, and the four darts are boned.